desertbest.com is a one-stop source for news and reviews about the best California’s Coachella Valley has to offer both year-round residents and visitors to its desert resorts from around the world. 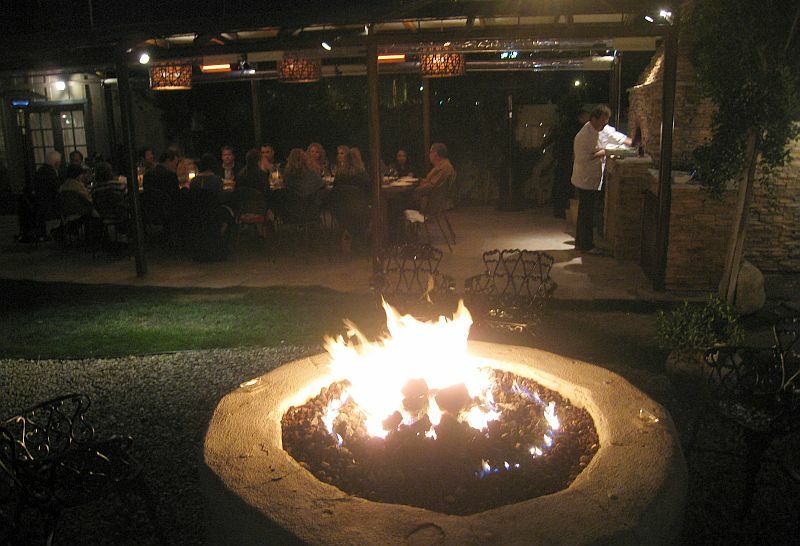 For some of the best dining options in the Coachella Valley check out Desert Dining. 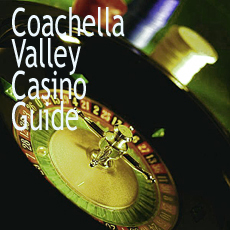 You can find some of the Coachella Valley’s best hotels, events and attractions, go to Hotels, Events and Attractions. No trip to Desert Hot Springs is complete without a visit to Cabot's Pueblo Museum. 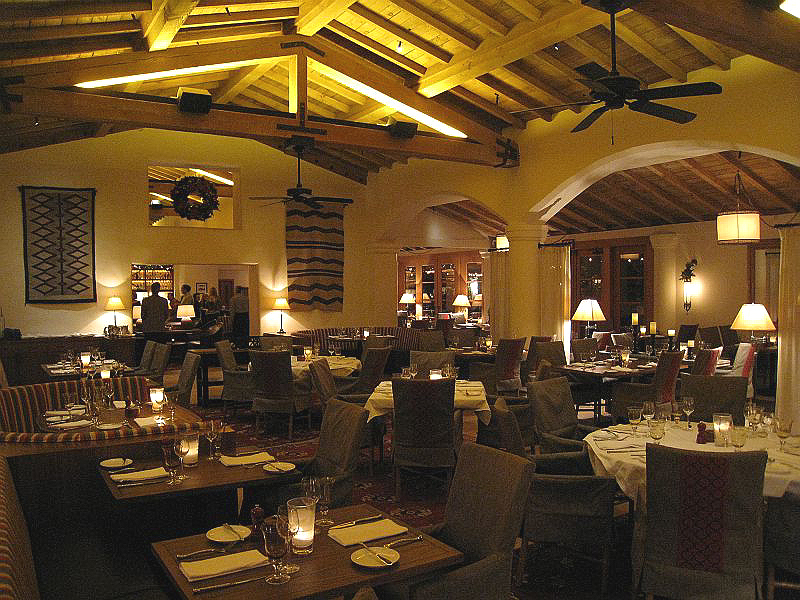 Built on a hill overlooking the valley floor and the Santa Rosa Mountains, the pueblo is a testament to hard work, smart building, and clever entrepreneurialism in the American West. 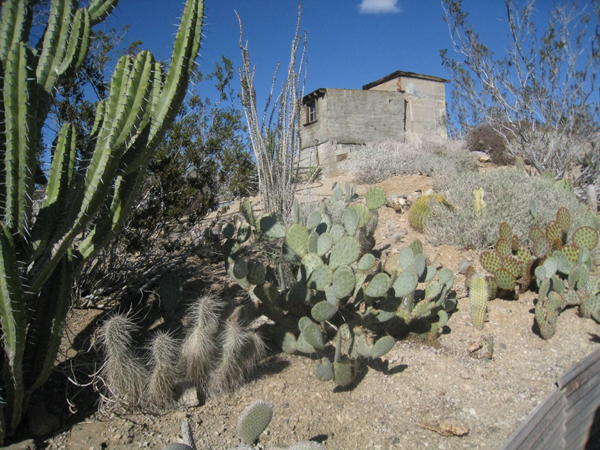 Cabot Yerxa was one of the area's first homesteaders. He arrived in 1913, claimed a homestead of 160 acres adjacent to Two Bunch Palms, and slept in a cave, until $10 bought him a burro named "Merry Christmas", which helped him build his cabin called "Eagle Nest" on Miracle Hill. Since his only water source was 7 miles away, Yerxa began digging a well for himself and found water, only it was a scalding, 132 degrees F. And after the hot springs were discovered, in 1940 there was the first talk of a town, which eventually became Desert Hot Springs, home of some of the best municipal water in the world. And yes, it tastes fabulous. Choose your favorite brand, and add "of the desert." i.e. "Evian of the desert". That's what it tastes like. With this news of a town, Yerxa started his Indian Pueblo on Miracle Hill, which is now Cabot's Pueblo Museum.The 35 room pueblo is fascinating to view from the outside and the inside. Most of the inside can only be viewed from the tour, which is recommended. 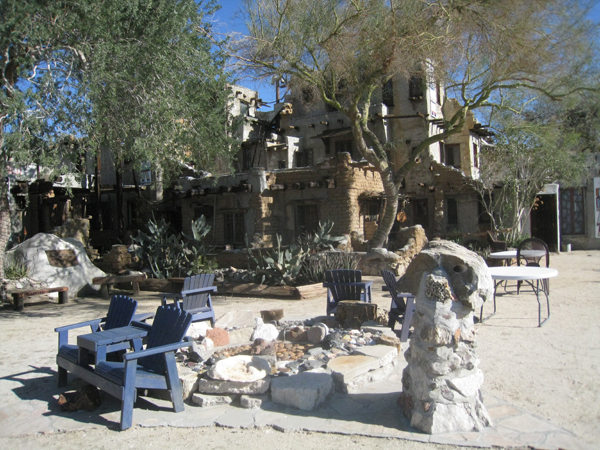 The docents are knowledgeable and enthusiastic and provide the intimate details needed to fully understand the life of Cabot Yerxa, his family, his son, his divorce and his second marriage to a woman who would only live at the pueblo if she could have a refrigerator and a bathtub installed. Yerxa happily obliged. 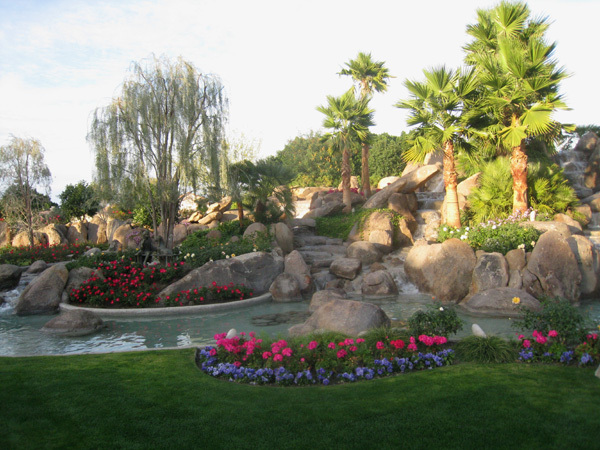 In addition to the view from Miracle Hill, the pueblo boasts some fabulous cactus gardens and water amenities. 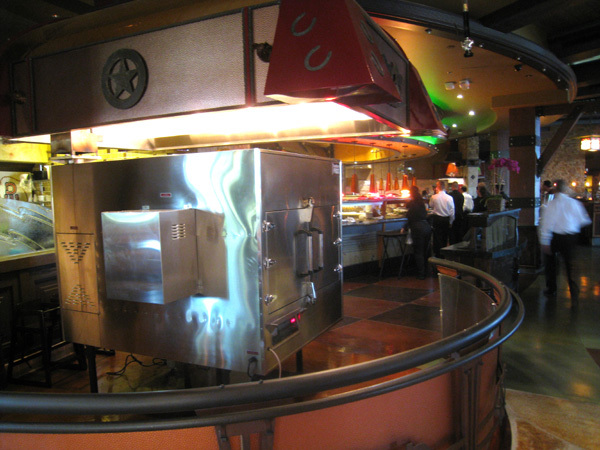 Yerxa was among the first to create a misting system for the inferno-like summer days. The construction strength of the pueblo is remarkable to behold, as it sits right near the San Andreas fault, has gone through plenty of shakers, yet remains solid, cool construction for the desert. Combine the pueblo's story and history with its exceptional docents, well stocked and designed gift shop, and personal touches such as hot Starbuck's coffee and bakery treats for guests, and this museum is a complete winner.The question is, how do I get more of that fine Desert Hot Springs municipal water? You'll think you're on Mars! The road to Borrego Springs is unlike anything you've seen, taking you past date palm groves, the Salton Sea, what seems like a hundred mini Grand Canyons, oceans of arid desert cacti, and pops you out into Borrego Springs, a quiet, private oasis and secret getaway for San Diegans and other in-the-know desert dwellers that like the idea of being somewhere charming and special smack in the middle of nowhere.Go to Christmas Circle where you'll find darling gift shops with amazing desert souvenirs. Pick up a book on Roadrunners and an owl-shaped Christmas ornament made from a gourd.From Christmas Circle, it's a short hop to the newly re-opened La Casa del Zorro, a legendary luxury resort whose reputation has attracted a staff and clientele from all over the world. It has amazing rooms, restaurants, pools, tennis, golf, outdoor activities like horseback riding and 4-wheeler desert outback adventures, and a commitment to privacy that even the most famous person in the world would love. And even more special, it has archery!!! A full service archery range with classes. The resort even features a weekend archery package. Wake up that Sagittarius inside you and pull back a bow. From La Case del Zorro, it's on to Anza Borrego State Park. The largest desert state park in the US, with over 600,000 acres of playland!! But be judicious and let someone, preferably a ranger, know where you are, as this is wild land, people. A wild land full of amazing desert flora and fauna, clean air, fabulous sun rises and sunsets, and some of the most remarkable desert terrain you can see in America. Driving Directions:The scenic route from the Coachella Valley: Approximately 1 hour and 45 minutes.Take 111 south and east to CA 86 South toward Brawley/El Centro and go approx. 48 miles.Turn Right on CA 78, go approx 23 miles.Turn right on Borrego Springs Road, which will lead you right into town. Your first stop is Twentynine Palms, which combines desert history and funky local art with the United States Marine Corps Air Ground Combat Center. If you're lucky you can catch an early morning dog fight between two F-18s. Godspeed, guys!! 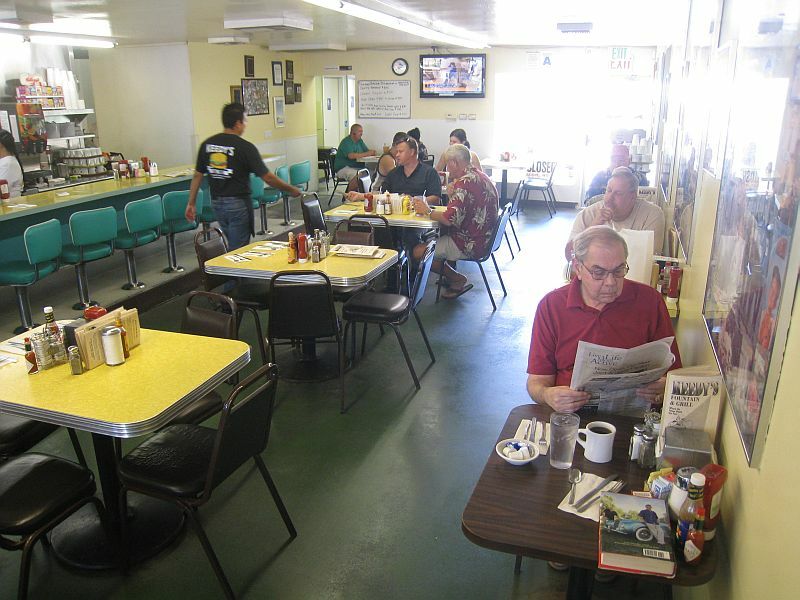 Then it's on to Amboy, CA home of the famous Roy's, an abandoned roadside diner which has been used in movies and commercials for years. Although the town is for all purposes a ghost town, you'll find plenty of Route 66 tours stopping at Roy's for the famous picture underneath the big sign. Other attractions in Amboy include the famous Route 66, the Amboy crater, and a railroad offering a close-up view right beside the tracks. Moving on, the next desert town you get to is Kelso, CA. You must visit the Kelso Train Depot which is now the Visitor Center for the Mojave National Preserve. 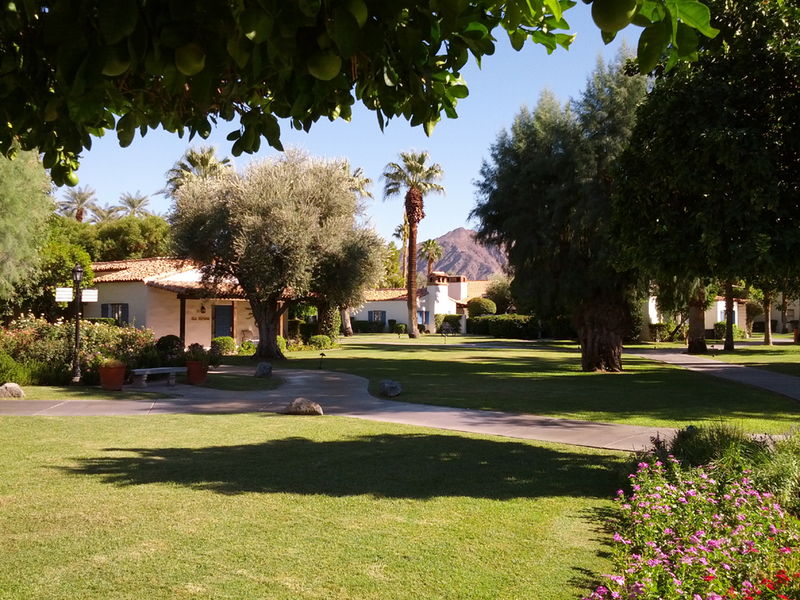 There's a small museum inside which shows the romantic history of this isolated train depot, when people like Douglas Fairbanks got off the train from East to West Coasts to take in the desert air and sunset. You can use the restroom and get some water here too. Rumor has it they're going to open a full service diner at the counter downstairs. We hope it's not just a rumor. Then it's on to Cima, CA. At the Cima store, you can buy cold drinks and snacks which will last your whole ride through the beautiful Ivanpah Valley, until you pop out at the 15 to get to State Line for your casino buffet, then onto Las Vegas. And as we all know, what happens in Vegas, stays in Vegas. The back roads to Vegas are filled with unique desert activities, like "booming the Kelso Dunes" (see website below) and natural wonders like the salt flats, the rocks near the Kelso Dunes, one of the closest things to a Martian landscape here on Earth, Joshua Tree and the Amboy Crater. 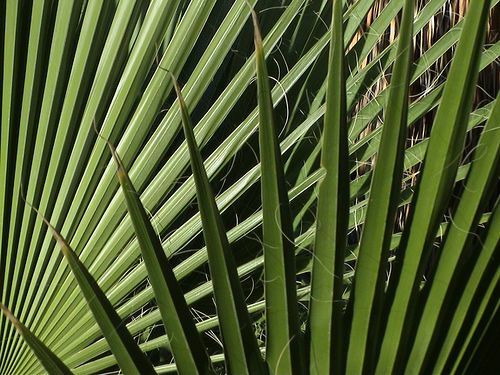 Please make sure to leave Twentynine Palms with a full tank of gas, and least two gallons of water or an equivalent quantity of sports drinks. Have your cell phone charged. Cell service is spotty, but reliable when you find it. You do not want to be stranded out here alone in what can be 110+ degree summer temperatures, and last we heard it'll be expensive to have local or state authorities rescue you from this magnificent desert wilderness. Driving Directions:Take the 10 West or East (depending on which part of the Coachella Valley you're coming from) to the 62 North to Twentynine Palms. (Desert Hot Springs to Twentynine Palms is about 42 miles, so plan accordingly). You will turn left on to Utah Trail for 1.5 miles, then right onto Amboy Road.Follow Amboy Road, then veer left onto S. Amboy Road. Note that S. Amboy Road becomes Amboy Road, then North Amboy Road. 3 names, one street. Keep following it. It's about a 20 mile jaunt.You'll cross the railroad tracks and come into the town of Amboy, where you'll be on Historic Route 66. After your photo stop at Roy's you'll follow route 66 to Kelbaker Road.Turn left on Kelbaker Road. This is a 40 mile jaunt to Kelso. You'll cross under Route 40. Keep going. Now you're in the National Mojave Preserve. You'll cross the Union Pacific Line at Kelso, where you'll find the Train Depot.Head Northeast out of Kelso on Kelso Cima Road for 20 miles, which will put you in Cima. 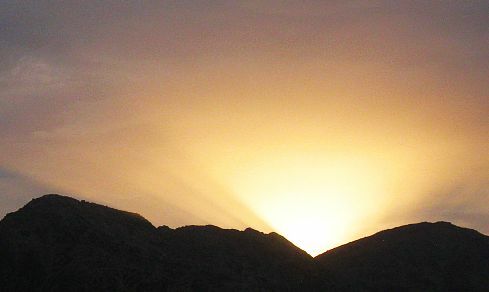 At Cima, you'll veer left and take Morning Star Mine Road for about 18 miles to its end where it veers left and becomes Ivanpah Road. In five miles, you turn left onto Nipton Road.Nipton Road takes you directly to the 15. Take 15 east. 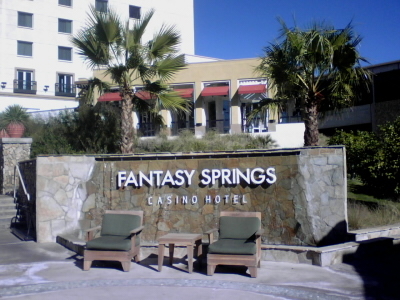 It's about 12 miles to Primm/State Line (make sure to ride The Desperado if you're a rollercoaster fan. The first hill is a doozy) and an additional 55 miles to Las Vegas. The entire trip can take from 4 hours to overnight, depending on how much stopping you do. Keep in mind there is NO LODGING or FUEL SERVICES after you leave Twentynine Palms going toward Las Vegas, and after leaving the I-15 coming from Las Vegas. With the numerous adventures, desert fun is never far away. Keep a full tank of gas, carry plenty of water, stay cool, keep your eyes on the magnificent scenery at all times, and travel on! 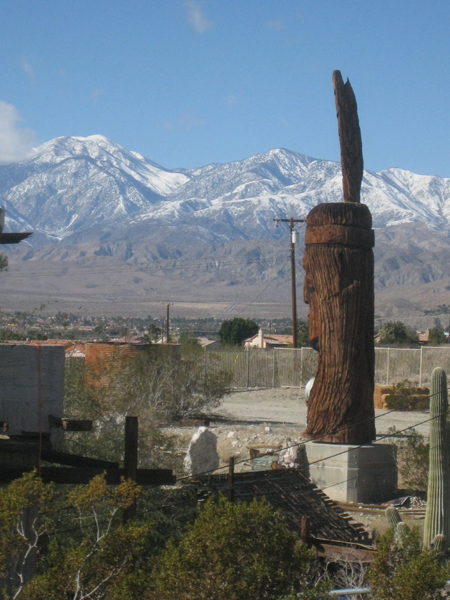 About an hour's ride out of the Coachella Valley is Idyllwild, a rural, rustic retreat town in the San Jacinto Mountains, with excellent local restaurants, small inns and cabins, and fine art and craft shops. CafÃ© Aroma and The Bread Basket serve delicious breakfasts. Shopping followed with perusing candles in the Idyllwild Candle Factory, smelling buds in Florist in the Forest, and filling our bag in Lady of the Lake Soap Shop. In addition to the town, Idyllwild is known for its rock climbing, hiking, mountain biking and camping. The excellent weather at Tahquitz and Suicide Rocks, gives rock climbers of all abilities a stunning, variable climbing experience. The mountain biking trails are remote, scenic and mountainous, and are never crowded. But don't go off the trails and don't litter! As for hiking, you can do a day hike or an overnight hike depending on your goal. And if you decide to stay overnight, you'll most likely find a camping arrangement to meet your needs so you can stare into the star filled dark nights above Idyllwild. How to get to Idyllwild: From Palm Desert, take Highway 74 West 'The Palms to Pines' Highway for about 37 miles to CA-243. Take a slight right onto CA-243 and go for about 4 miles to South Circle Drive, where you make a slight right, and it takes you to the center of Idyllwild. This is our favorite day trip. 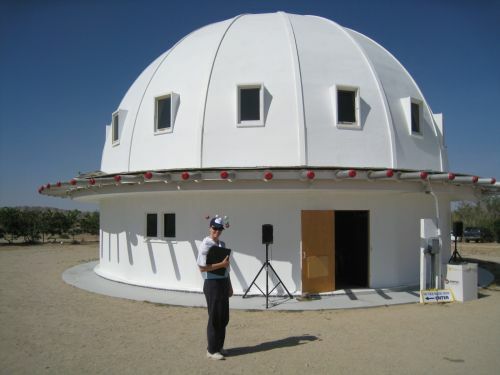 It's about a 1-1/2 hour drive from the Coachella Valley to Landers, CA, a desert town in the Morongo Basin, which is the home of the Integratron, a domed building constructed by a former Hughes Aircraft employee, who claims an alien told him how to build it, so it could rejuvenate human cell structure. We refer to it as the space-age "Fountain of Youth". While its use for cell rejuvenation is highly speculative, the Integratron offers a unique acoustic experience called a "Sound Bath." Lie on your yoga mat as nine quartz crystal bowls are played, attuned to the chakras of the body. Complete relaxation and focus do happen based on the sound. Scientists have proved that the Integratron is placed on a highly magnetic area of the earth, which may explain the feeling of bliss. Also nearby is Giant Rock, which was the world's biggest free standing boulder until it split in 2000. 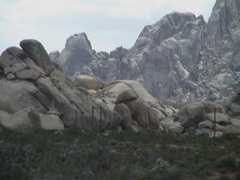 It's located on BLM land quite a way from civilization, so be mindful when going to see it. More info on it is included on the Integratron's website below.Also in Landers is Gubler Orchids, a fantastic orchid nursery which is one of the top orchid growers in the world. Offering free personal tours Monday-Saturday, they grow many types of orchids and endangered carnivorous plants such as the Venus Fly Trap. 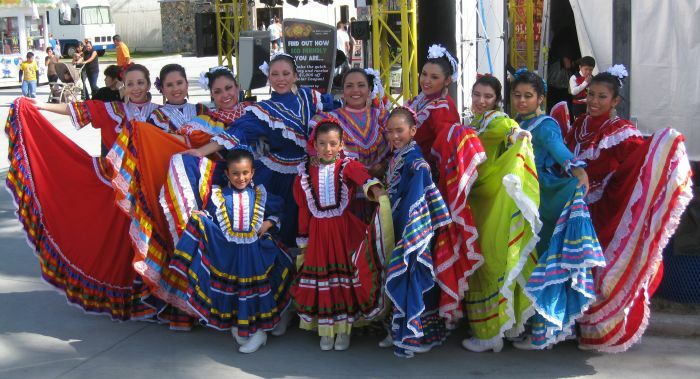 Annually, the Morongo Valley Orchid Festival is held in October, which features orchid activities and classes, live music, food and entertainment to benefit local charities. Visiting these unique destinations makes a day trip to Landers, an out of this world experience! How To Get To Landers: From the Coachella Valley, take the 10W to Indian Ave. Exit and go right. 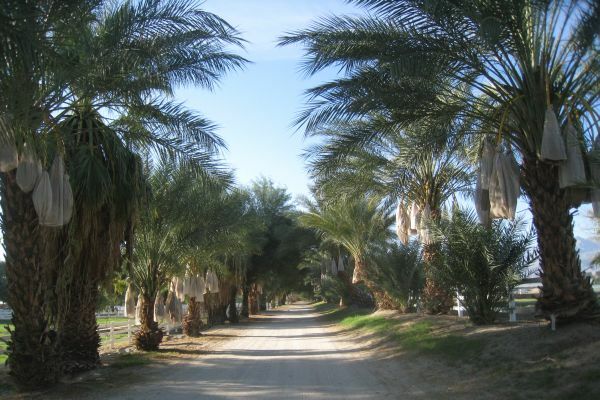 Follow Indian Ave. for 10 miles to CA-62E/Twentynine Palms Highway. Turn right and go about 15 miles on CA-62E to CA-247(also called Old Woman Springs Road). Take a left. Follow 247 to Reche Road and take a right. Follow Reche Road for 2 miles to Belfield Road, and you will see Gubler's come up on your left and the Integratron come up past it, on the right. But it's the Salton Sea, CA's largest lake, which is the main attraction. Very salty, sometimes sulfury-smelling, the sea is home to a plethora of bird species. Each February there is the Salton Sea International Bird Festival. www.imperialcounty.com/birdfest// Even though the Salton Sea had a dark, at times, seedy reputation, for its rundown, abandoned buildings and isolated environment, residents and environmentalists alike are changing the outlook, through culturally stimulating, and pioneering states of mind. Two pioneers in developing the natural beauty of the area are The Torres-Martinez Indian Tribe and Debi Livesay, who created 'California's Everglades,' the 7 year project of revamping 85 acres of the Torres- Martinez Indian Reservation into a freshwater haven for over 130 species of birds, which has many environmentalists and lawmakers watching what will happen. Check out the Los Angeles Times article. travel.latimes.com/articles/la-trw-wetlands24feb24 There have been many efforts to clean up the Salton Sea, even rumors that financiers want to build a canal to the Gulf of California to open the Sea to the Pacific. So far, very little has come to pass. Although its future is undecided, the Salton Sea and its surrounding areas are still a wonder of nature under a starry sky, waiting to be discovered once again. 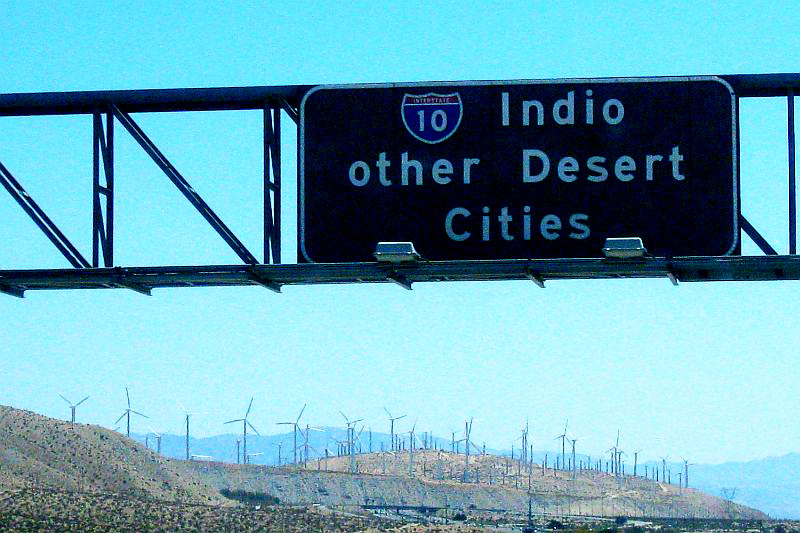 How to Get to Niland from the Coachella Valley: Take the 86S out of Indio. Travel 11 miles to 66th Ave. (Route 195). There is a big truck stop on your left. Turn left (East). (Important not to miss this turn or you end up on the wrong side of the Salton Sea!) and go about 1/2 mile to 111. Turn right (South) on 111 and go for 42 miles to Niland. 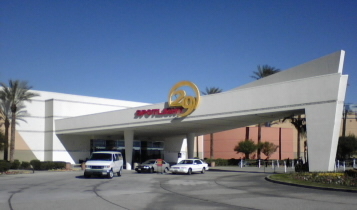 Here's a quick overview of the Coachella Valley's casinos. Most have great entertainment, but they're all very different and are best of the best for specific reasons. So read on! 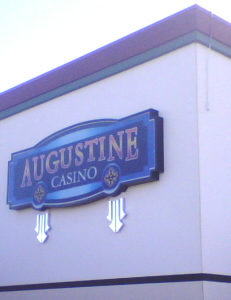 The following casinos are smaller. If you're looking for a night out with a lot of multi-denominational slots, a couple of table games, and some food, here are two places to go. Since 1999, Johannes Restaurant has served "award-winning, inventive Euro-Austrian cuisine with a global twist". Owner and creative chef Johannes Bacher, whose background includes working at the London Hilton, to being the executive chef on a luxury private yacht, brings an elegance and delicious romance to his menu and his venue. 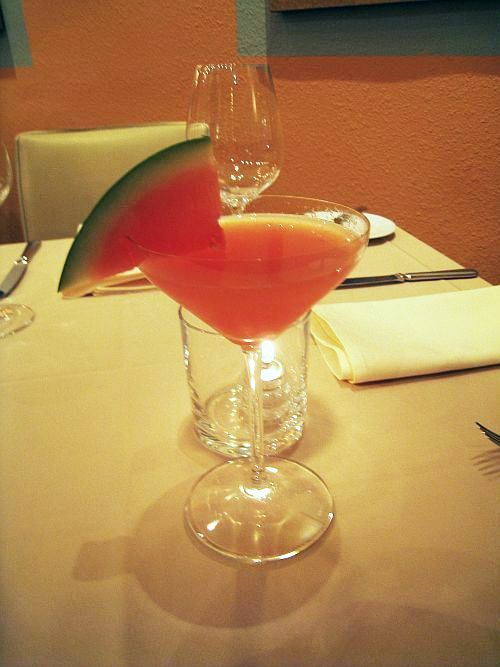 Located on the corner of Indian Canyon and Arenas Road, Johannes has a welcoming, at times, dreamy atmosphere which hugs the customer in its light, earth tones, providing a perfect backdrop for martinis called the ECU, created with housemade cucumber infused vodka, or the luscious watermelon martini which is the seasonal favorite! The wine list is thoughtful, global, and comprehensive, including SoCal wines from Rosenthal in the Malibu Hills, selections from the Russian River Valley, Napa, Sonoma, and Mendocino, as well as remarkable Rieslings from Austria, France and Germany, to Merlots and Petit Syrah from Australia and New Zealand, and a mostly Austrian, selection of sustainable, organic, and biodynamic wines. The beer and sake lists are also remarkable. The surprise, all lists are very reasonable. Enjoy. Big time. Now that you have your drinks, prepare for appetizers like escargots and rabbit in puff pastry with a garlic-herb sauce, smoked Idaho steelhead trout with Granny Smith apple herb salad, or endive and radicchio salad with grapes, pecan praline, Asian Pear, bleu cheese, black currant Dijon dressing, and crispy smoked veal bacon. All have enticing flavors and the serving size is perfect. The entire list is wonderfully varied, featuring the venerable Veal or Pork Loin Wiener Schnitzel with roasted parslied potatoes, cranberries, cucumber in sour cream dressing and lemon, or the adventurous Australian grass fed kangaroo loin with fennel, orange and herb salad, broccolini, and a Juniper Merlot reduction which adds the right amount of sweet to complement the bold meat. Other diners recommended the incredible sear-roasted organic Alaskan king salmon, the New Zealand grass fed young lamb rack, and the Japanese spice crusted seared rare ahi. 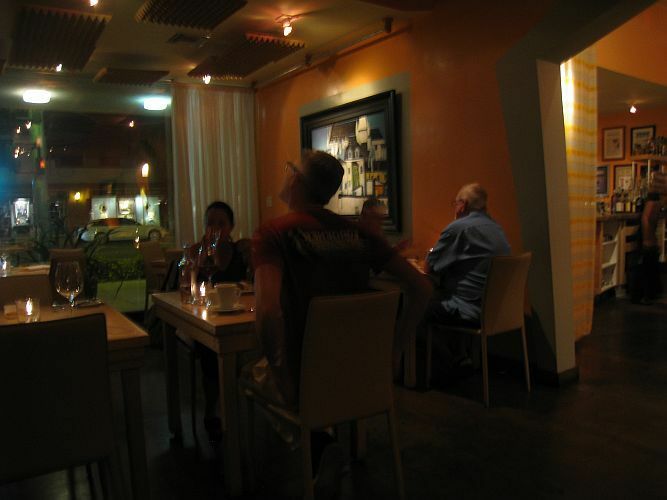 This hidden gem of a restaurant, located in a strip mall within a stone's throw from the Washington St. entrance to Interstate 10, run by a chef who used to cook in such legendary LA haunts as the Bel Air Country Club and Scandia, has no discernable sign and gets most of its publicity through word of mouth. That's how we heard about it. We were told it was a neighborhood secret, a restaurant with the most delicious food, generous portions and incredible value. All that was true, but it's much more than that. Chef George's, AKA The Velvet Turtle (there's a story here, but we'll let them explain all that), serves among a long list of delectable entrees, what must be the best Hungarian food in the desert, including their signature authentic Hungarian goulash with perfect cuts of beef, stuffed cabbage and a flavorful chicken picatta. 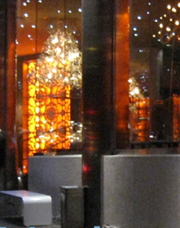 Sloping windows of light: Executive Chef Francois de Melogue and a guest discuss the cuisine. 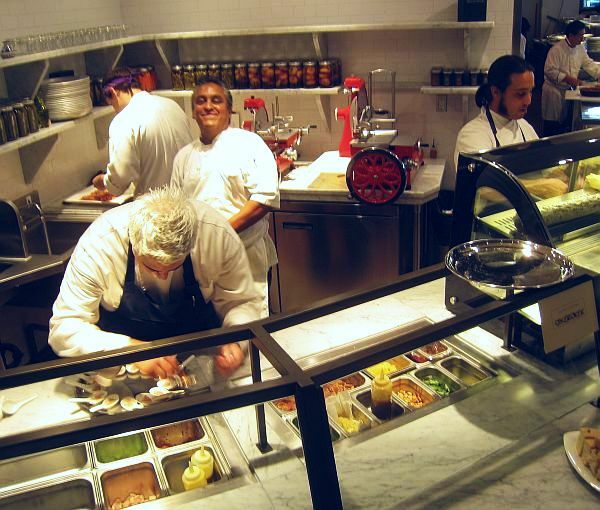 The open kitchen lets everyone interact with epicurean, creative exuberance. 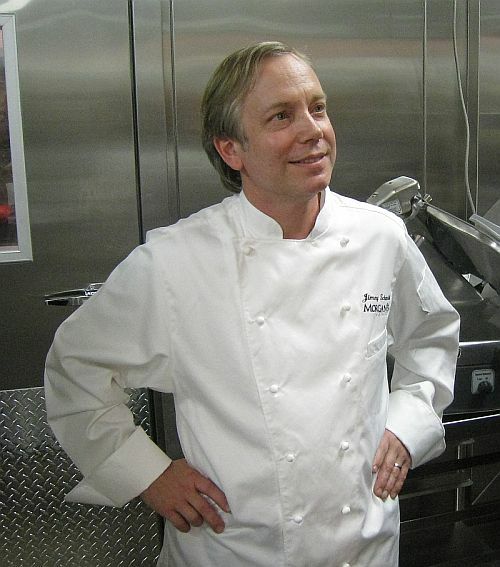 Figue is the newest “child” from Lee Morcus, Principal Proprietor of LMLQ Restaurant, LLC. Taking residence in the architectural masterpiece of the former Omri and Boni, it uses its high ceilings, grand sloping windows, pastel works of art, driftwood sculpture and open kitchen to create a relaxing, ebullient atmosphere. There are moments in Figue where you feel as if you're floating inside an aquarium, while looking at the blue art, or discovering the art and light hanging from the ceiling. 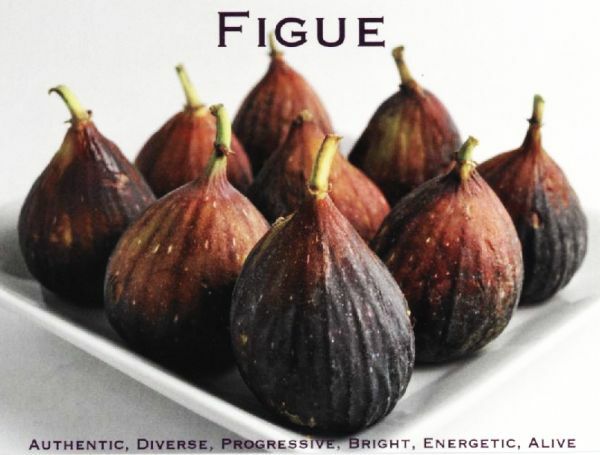 Figue's cuisine is progressive Mediterranean with strong infusions of Provence, Morocco, Italy and Spain. Start with Fideua – Rustic Catalan Pasta Paella, Lobster, Clams, Shrimp, Aioli. 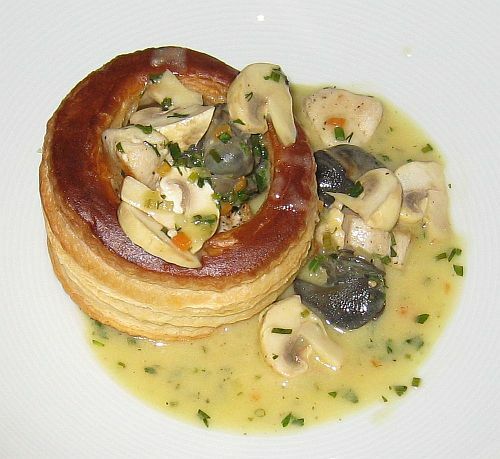 Enjoy a small dish of Artichoke Tart Tatin – Caramelized Fennel and Onion, Goat Cheese, Olive Emulsion. Continue with Elysian Fields Lamb – Potatoes Vesuvio, Broccoli Rabe, Barbera Aglio e Peperoncino Olive Oil. Finish with Barcelona Liegeois – Iced Espresso, Chocolate Sorbet, Marcona Almonds,Salted Caramel. Sit at the retro counter or the tables, all's good at Keedy's! If you like McDonald's fries, you're gonna love Keedy's fries! Time travel anyone? 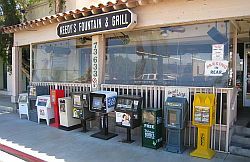 Open the swinging glass door of Keedy's Fountain and Grill in Palm Desert and shazam! You're in a classic fountain diner of the 1950s. 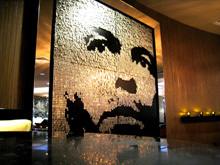 Sit yourself down at a metal rimmed table or grab a stool at the shiny fountain and take a good look around, under the watchful eye of the legendary movie stars and athletes whose pictures adorn the walls. Your server has already spotted you and will be over instantaneously. The service by far, is of the highest caliber. It is always fast, and one step ahead of the customer. Expect to be asked if you'd like another drink by the time your glass is half empty, or have a ketchup appear in front of you just before you raise your hand to ask for one. Serving breakfast and lunch only, Keedy's delivers a mean steak and eggs, and the fluffy pancakes and sausage are the ultimate in taste and texture. At lunch, the “Keedy's Fix” is always recommended! It's their menu of burgers, made as you'd like them. I also love the chili which has a perfect ratio of beans to meat, and the Reuben is spot on with a sizzling blanket of cheese covering the right amount of corn beef on strong rye bread. They serve salads, and house specials like chicken stir fry with rice and fish and chips. The french fries are fabulous! 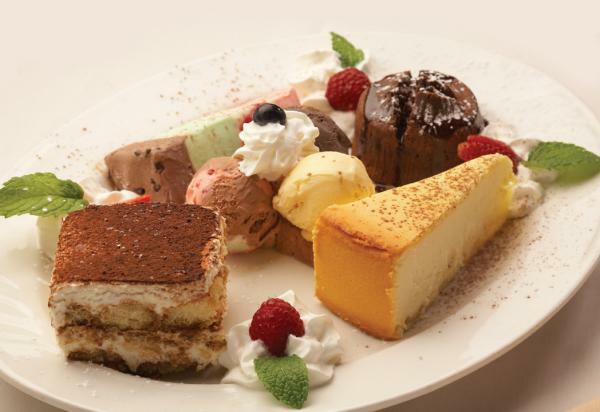 All portions leave you feeling just right to fit dessert. With a menu of delicious old fashioned shakes, malts, root beer floats, sundaes, and ice cream sodas, throw caution to the wind, and let their fountain wizards complete the perfect, American meal. Keedy's calls itself “A Blast from the Past”, but rest assured, it's alive and well in the present, too! Now that's Italian!!! 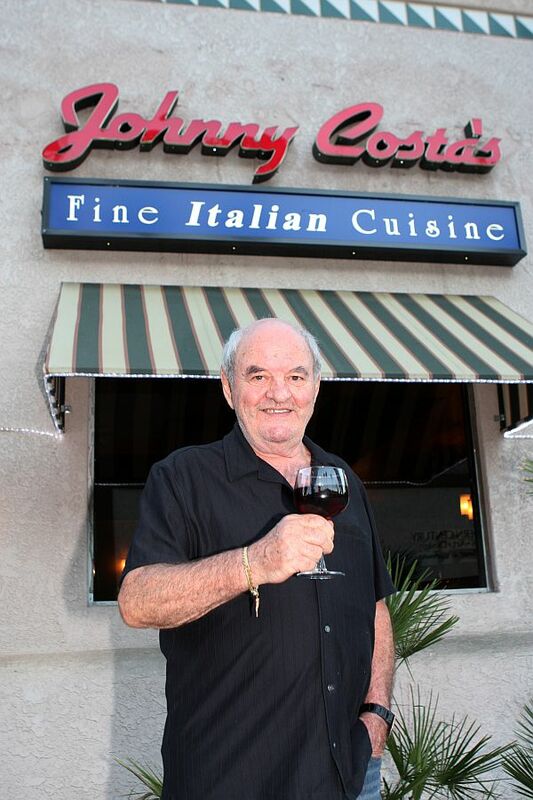 Johnny Costa's is a fantastic Italian restaurant yes, but it's also a Palm Springs landmark because of Johnny's remarkable life, which brought him to the Coachella Valley over 30 years ago. Born in Naples, Italy, Johnny worked in New York and Las Vegas before landing the job of sous chef at the legendary Villa Capri in Hollywood, where he met his future business partner, Maitre'd Tony Riccio. While at the Villa Capri, Johnny met Frank Sinatra, and learned to make Frank's two favorites, Steak Sinatra and linguini with clams. Hired by Riccio as Head Chef at Martony's in Hollywood and then, the famed Club Trinidad in the desert, the frequent hangout of Bob Hope, Steve McQueen and The Rat Pack, Johnny's star rose, and in the mid 1970s, Frank Sinatra hired him to be his personal chef at his estate. Leaving Frank, Johnny opened his first restaurant in Desert Hot Springs, then Cathedral City, before coming to Palm Springs, where the restaurant remains today. 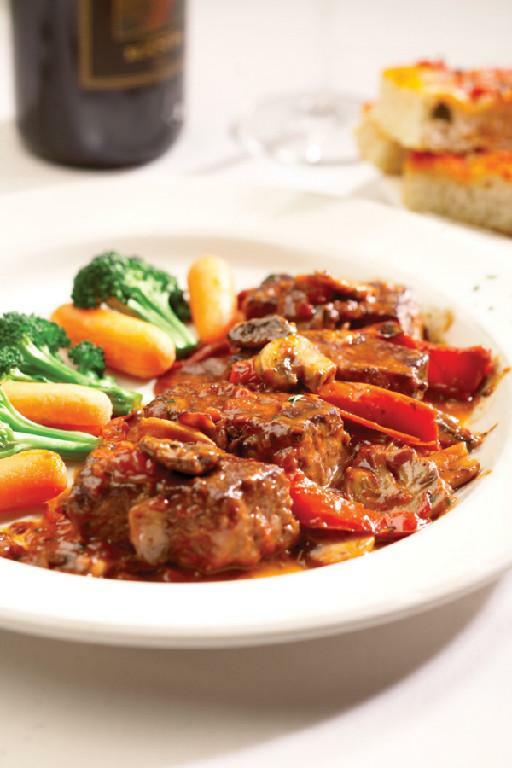 Johnny has passed his culinary talents to his son, and Head Chef, Vince Costa, who continues in the delicious, Napolitan cuisine which made his father famous. Enjoy a wonderfully varied menu in the relaxing, cool, comfortable dining room, with appetizers like Prosciutto and Melon, or a killer Caesar salad, followed by entrees like the classic eggplant parmigiana, or a deep, robust Linguini Shrimp Diavolo (it's normally made with lobster, but we requested shrimp) or broiled Fresh Salmon and Vegetables. Add to these entrees, a Chianti served at perfect temperature from Costa's wine cooler, and the package is complete! WAIT! Dessert!!! How could I forget??? Probably because it didn't last long on its plate! We enjoyed a very good cannoli, and recommend Johnny's homemade tiramisu and creme brulee. It puts a perfect touch on fantastic dinners that began over 30 years ago. 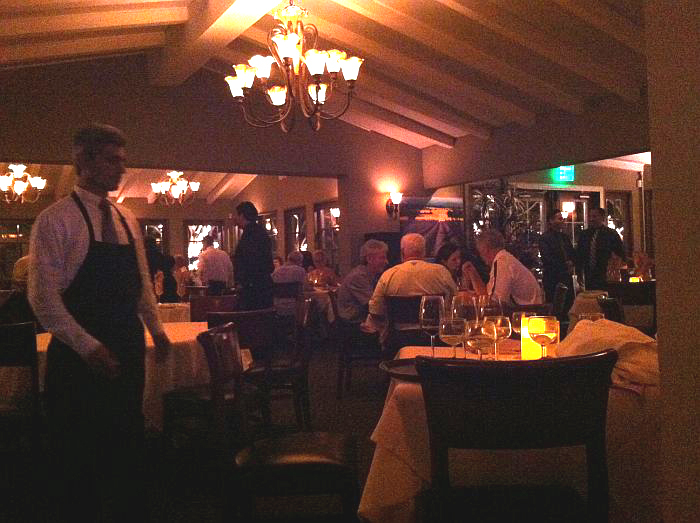 Johnny Costa's truly is a Palm Springs legendary dining experience. 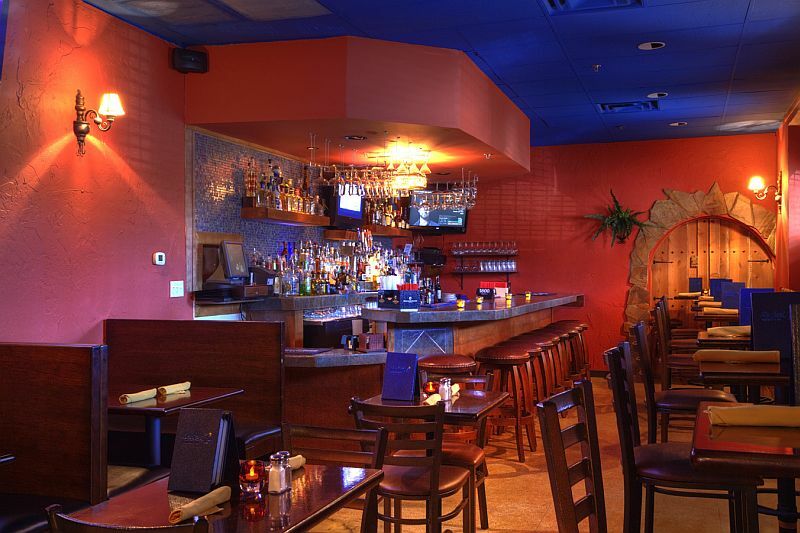 Private and unassuming, Rio Azul Mexican Bar & Grill is yours to discover. Handcrafting Palm Springs' only traditional Mexican cuisine, Rio Azul serves up a mouthwateringly unique menu enhanced by its comfortable and cheerful, earth toned atmosphere. The entrees! You must try the Enchiladas del mar; crab meat and sauteed shrimp meet bell peppers, onions and tomatoes, rolled in flour tortillas, and topped with homemade cream sauce and cotija cheese. This is the standout dish of its kind in the valley. We also recommend the Parrilladas for any number of people. Parrilladas are a Mexican tradition which include marinated cuts of meat such as grilled shrimp, wrapped shrimp stuffed with jalapeno and jack cheese, delicious quail, grilled chicken and steak with vegetables. Add sides of fresh guacamole, sour cream, pico de gallo, Rio Azul's four cheese blend chili con queso and refried pinto or black beans, and you've got an exclusive, original dinner. Lucky for us, Rio Azul is now serving breakfast from 11 AM on Saturday and Sunday. Everything on the breakfast menu is $9.95 and you can down a House Margarita for $5 from 11 AM to 5 PM. 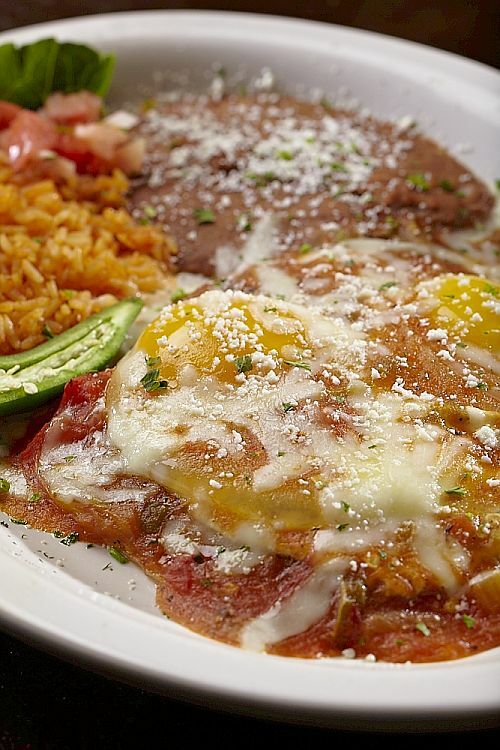 The Huevos Rancheros is on the mark with soft corn tortillas topped with refried beans, eggs, cheese and ranchera sauce. We're looking forward to trying the Machaca con Huevo which is shredded beef mixed with eggs, bell peppers, onions and tomatoes. 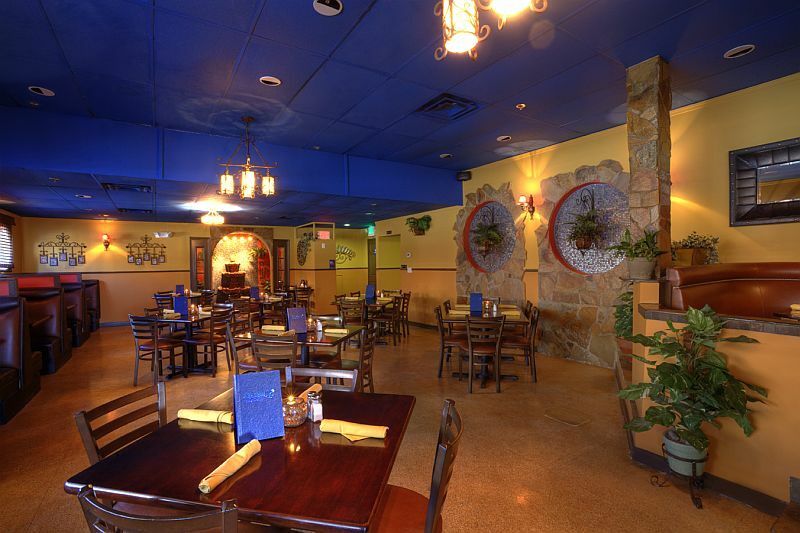 However you cut it, Rio Azul Mexican Bar & Grill has you covered, breakfast, lunch and dinner. Fresh, special, a small gem on Indian Canyon. It is the best Mexican restaurant in the West Valley. 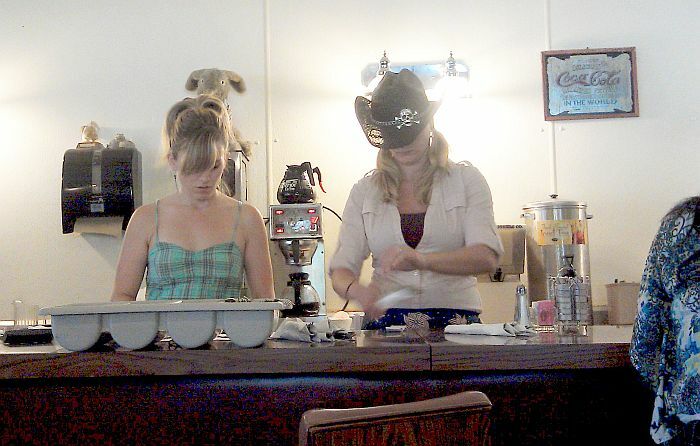 Two of the gals who do an incredible job of running the Sidewinder Grill. 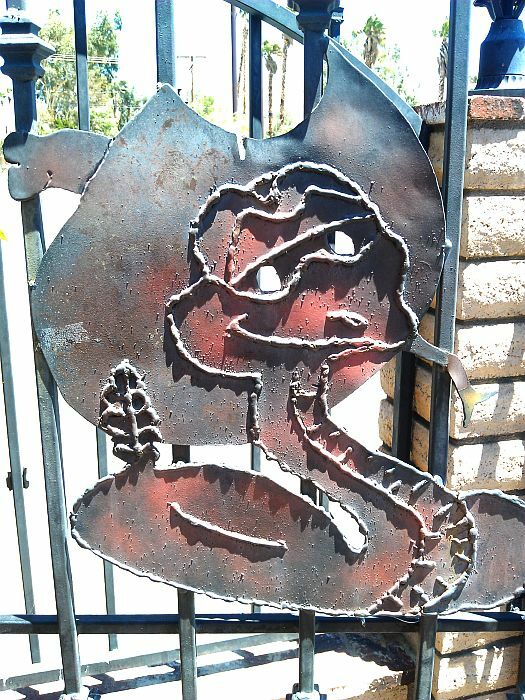 The wrought iron Sidewinder himself! Buy it when you see it at Gypsyland, because if you wait, then come back, it'll be gone. A unique touch of turtles. Off the beaten path… Way up on Pierson Blvd. 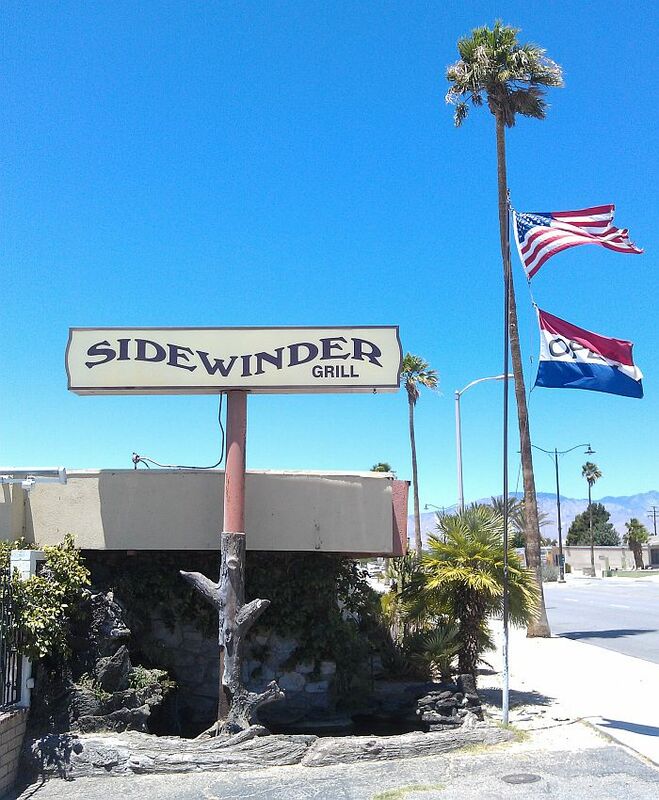 in Desert Hot Springs sits the retro Sidewinder Grill. A perfect diner, fresh food, great prices and the attractive gals who operate it take no prisoners. They love their restaurant, they know how to cook, and they expect you to like your food. Not hard to do. We went for breakfast. Sensational. And we drove all the way from the East valley, so that gives you an idea how much we like Sidewinder Grill. The interior is 1970s wood paneled, with a fantastic counter, great booths and tables, a private dining room for parties, and a rugged bar hidden off to the right when you walk inside. 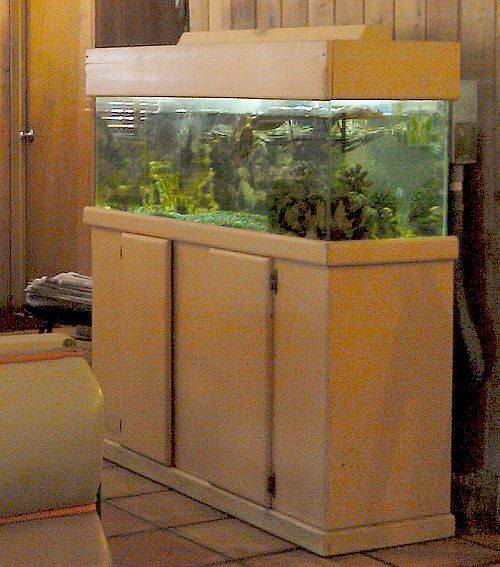 There is also a fish tank of happy, swimming turtles, adding a touch of aquatic nature and uniqueness to this desert haunt. 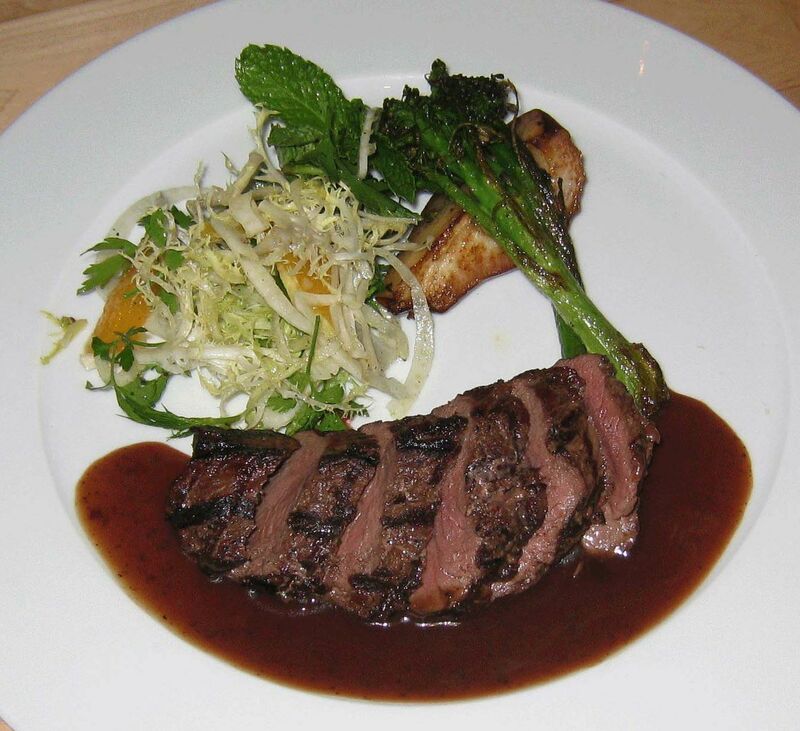 The food is well thought out, with the menu streamlined to provide classic and contemporary diner cuisine. The veggie omelet is best in the desert. The French toast is fluffy, the bacon is crisp, with no oil. Service is fast with a smile. The prices are right. 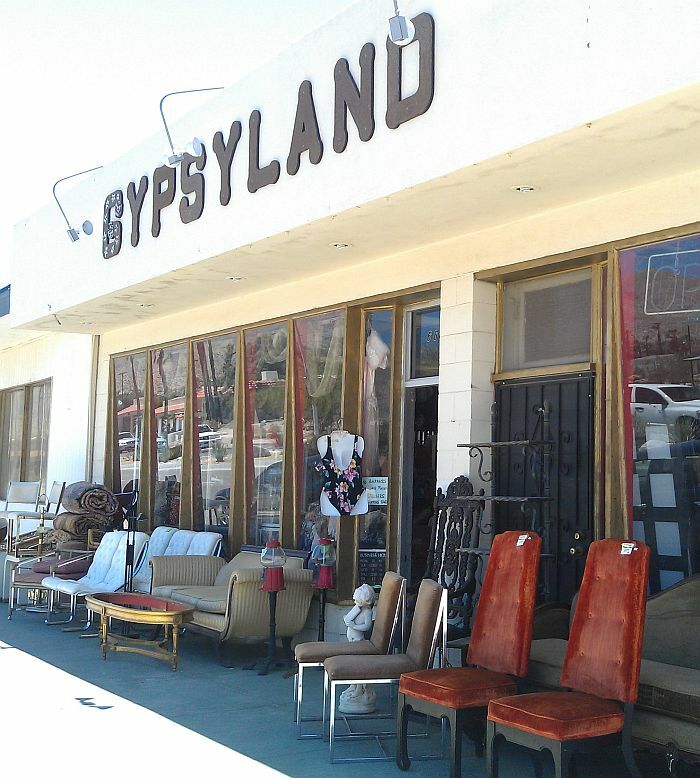 Located paces away from the vintage store, Gypsyland which is fast becoming a Los Angeleno favorite, Sidewinder would be a great place to have lunch or a drink at the bar at night. Sidewinder blazes a unique trail in Desert Hot Springs. It's a welcoming combination of the retro past meeting today's menu and service demands with enthusiasm. We can't wait to try lunch and dinner too. 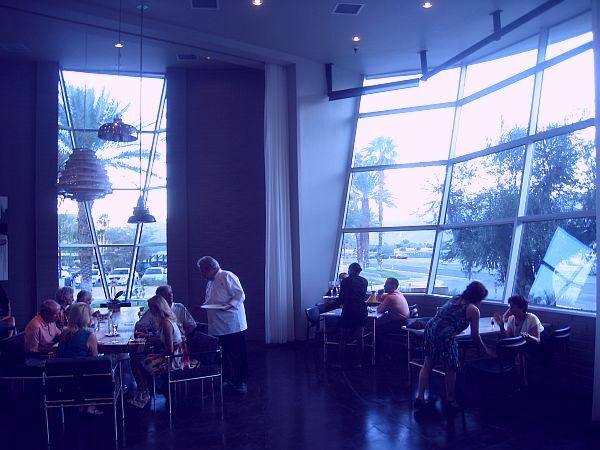 Striking a pose at the gateway to Palm Springs' Uptown Design District, Trio Restaurant offers stunning modern design, relaxed atmosphere, meticulous service, and the best modern take on American food in Palm Springs, if not the whole Coachella Valley. 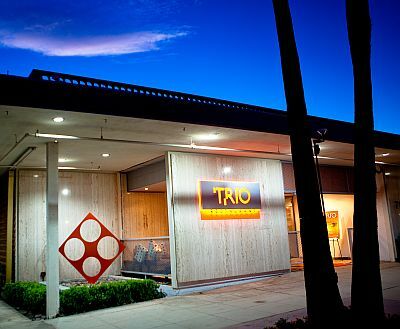 Trio to us, is a most unique restaurant. It does what no other valley restaurant does. 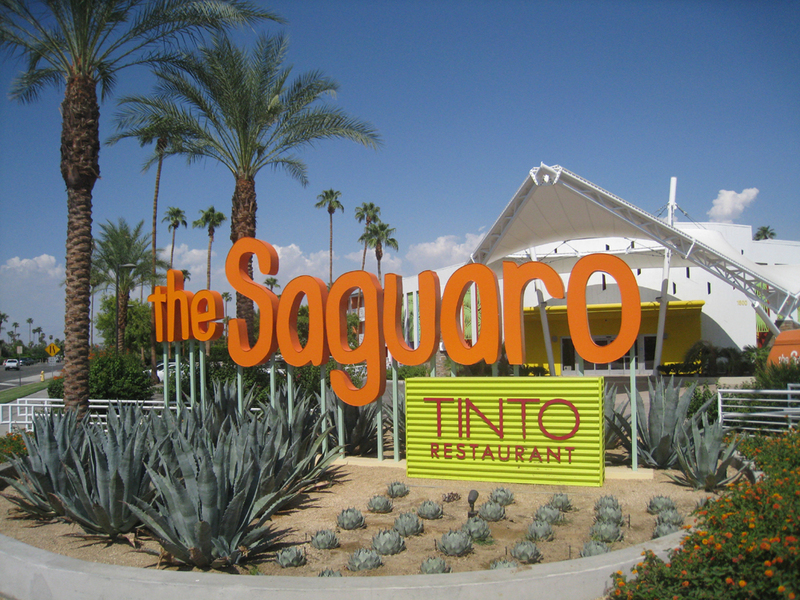 It straddles the line between the West and the East Valley, attracting diners from as far out as La Quinta and Indio. You'll find everyone from Palm Springs' hottest designers to Thermal's dressage and hunter riders to international clientele coming in for a twilight meal. Baby, this place is worth the trip. The bar is fantastic. 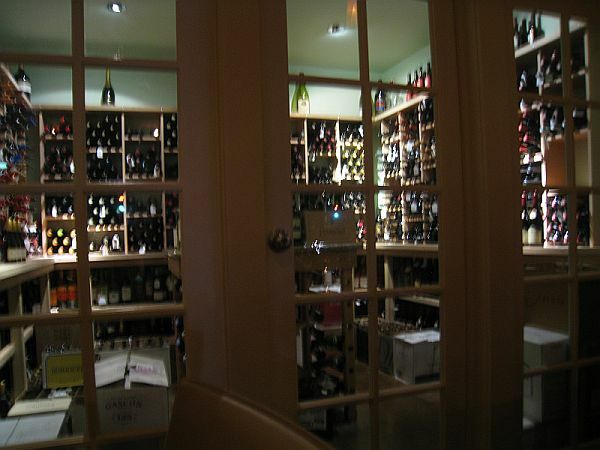 The wine list is international with different colors and flavors from the Pacific Rim to Europe to South America to Napa. Beers include locals, like Orange Wheat from Hangar 24 Crafted Brewery in Redlands, CA, and Green Flash India Pale Ale from the West Coast I.P.A. The specialty cocktail not to be missed is “Aime's Black Widow” comprised of Grey Goose, vanilla vodka, lemon juice, Agave and Chambord. The cuisine is nothing short of compelling comfort food. Typically not two words that are used together in a cuisine description, but this is no ordinary menu. Start with hand cut potato chips and home made ranch dip, fried artichoke hearts w/ caper aioli dipping sauce, or the delicate roasted baby beet salad. For entrees, the Australian sole is to die for; oven roasted with parsley, capers, lemon zest, bread crumbs and butter, and topped with Israeli couscous. 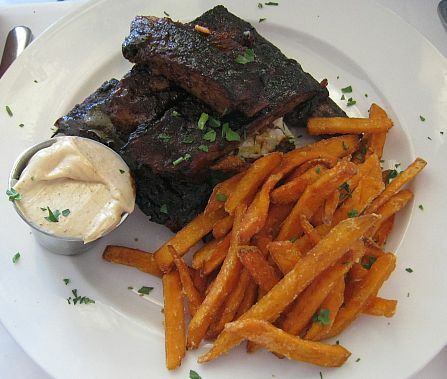 Also recommended are the St. Louis Style Spare Ribs, chipotle-rubbed with house made BBQ sauce, complemented by sweet potato fries and slaw. Two sides not to be missed are the sour cream mash and the mac n cheese. 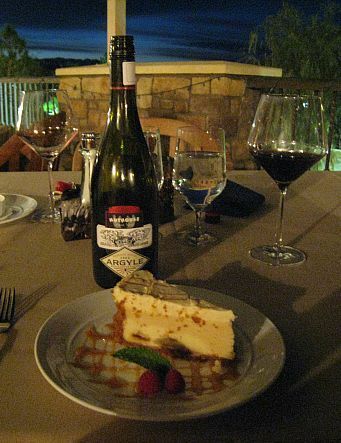 Desserts complete the perfect meal. Peanut butter pie, a Southern specialty, rocks the world. The hot brownie sundae takes full advantage of its house made brownie, vanilla ice cream and chocolate sauce. 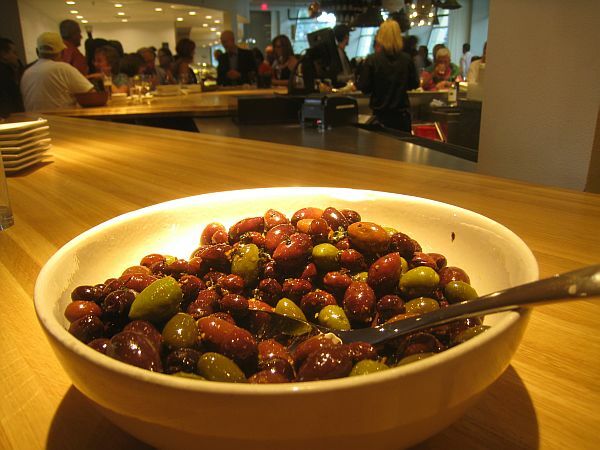 Whenever possible, Trio serves sustainable/organic seafood, all natural/organic meats and seasonal local produce. They also offer vegetarian selections and gluten-free options. Plus, there is take-out service available, and a fabulous frequent diners' rewards club. Any which way you look at it, you're covered. BBQ Deluxe! Anyone seen a Jackalope ‘round these parts? 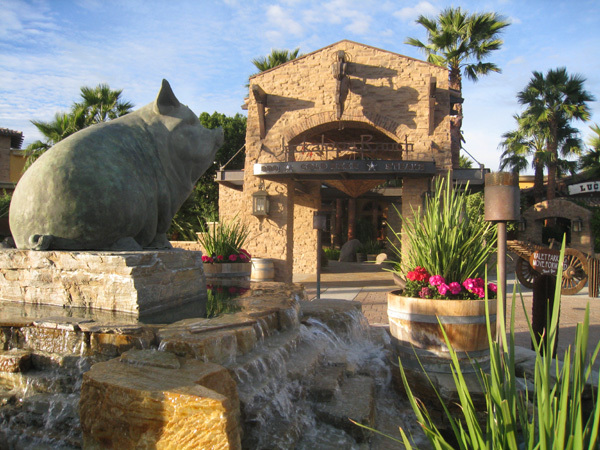 The Jackalope Ranch, the newest member of the Kaiser Restaurant Group, owners of the rocking Chop House Steakhouse in Palm Desert and Palm springs, The Clint Eastwood inspired Hog's Breath in La Quinta and Carmel, Fresh Grind Burger Bar in Palm Springs and the Kaiser Grille, also in Palm Springs! After the late Don Callender, founder of the Marie Callender's restaurant chain, spent something north of,oh….$36 million and change on this striking, must-see venue, a truly world-class tribute to the art of barbeque, here's what they've got to show for it! 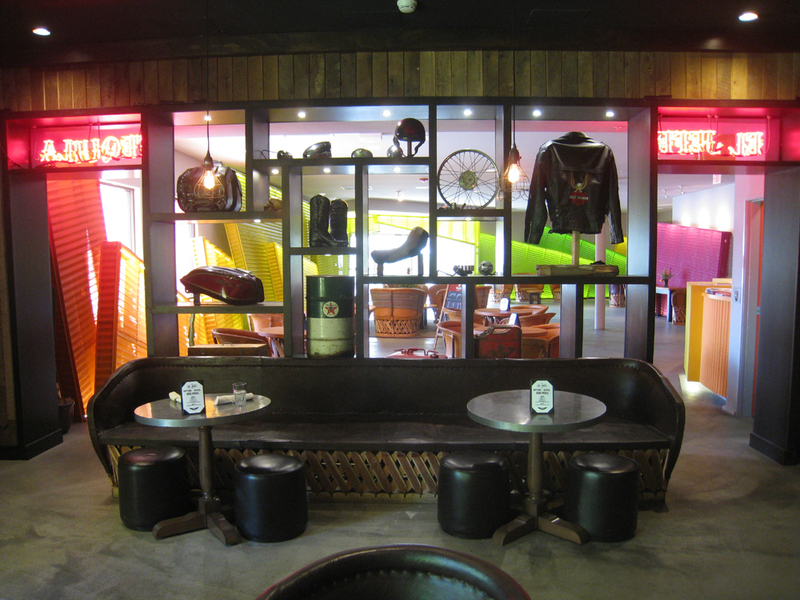 Great atmosphere, mouthwatering BBQ and Southwestern grub for lunch and dinner! Lot's of live music and here's even a fun two step line dancing event every Tuesday! And an outdoor Palapa patio with firepits and water amenities that make outdoor dining something to remember. Now I'll be quiet and show you… The Jackalope Ranch….. 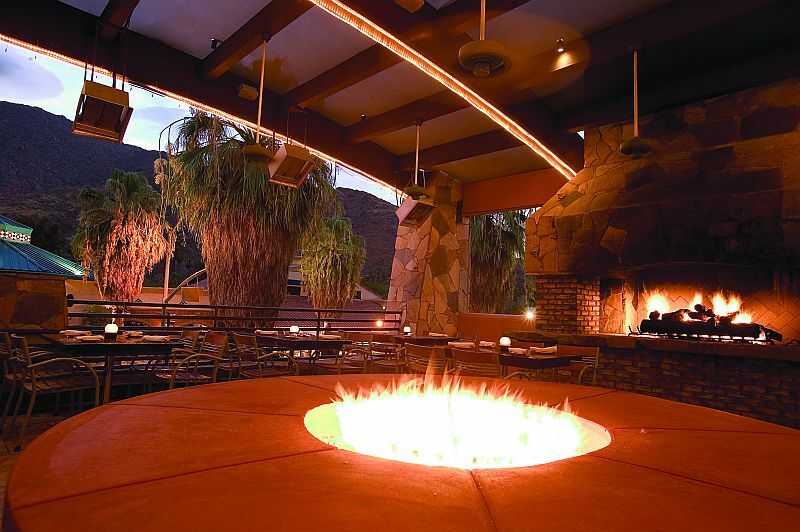 Romantic, eco-friendly innovation… Copley's Restaurant in Palm Springs is unlike most other top restaurants in Palm Springs because of its venue. 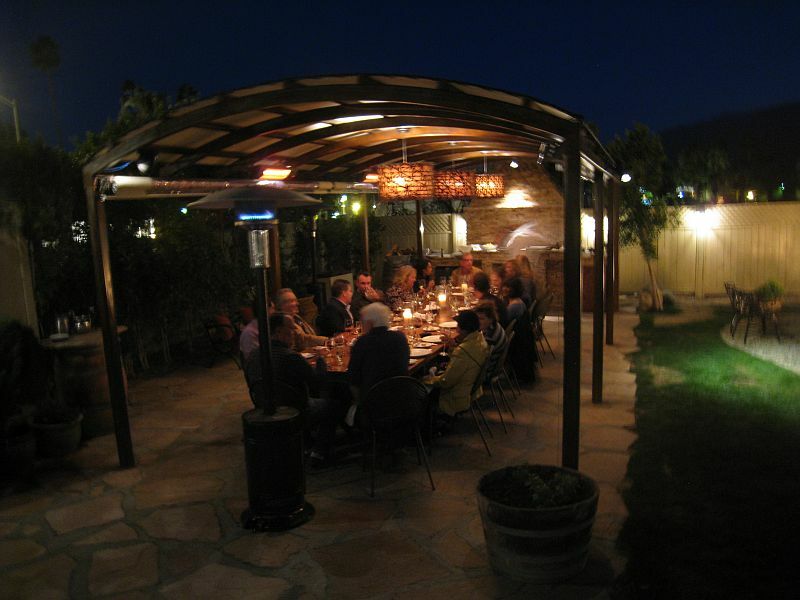 Nestled in a garden setting right on Palm Canyon Drive, (which happens to be the former 1940s guest house of actor Cary Grant) Copley's Restaurant offers a stunning patio under the whispers of a lush tree and the dark of the star-lit night sky. Inside, earth tones set off by rich woods create a simple, elegant relaxation; perfect for tasting the tiniest elements in any glass of wine. 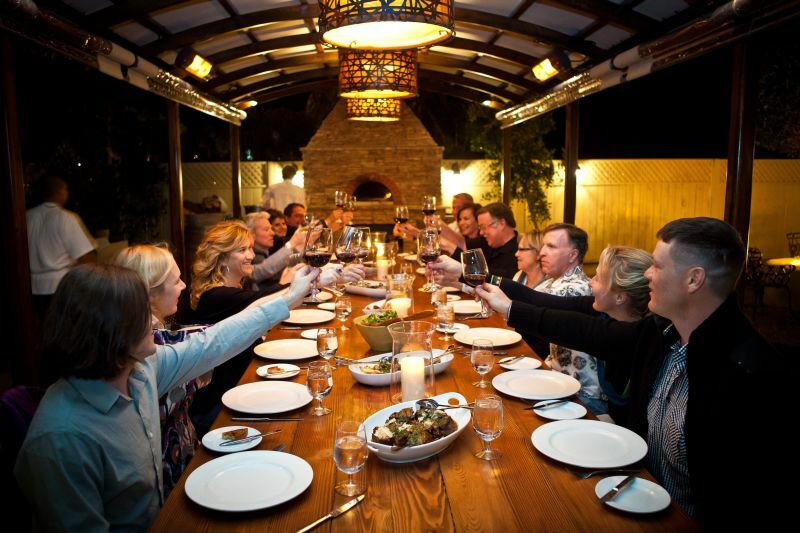 The newest addition from owners Andrew and Juliana Manion Copley and Greg Butterfield, is an outdoor wood-burning oven which is the centerpiece of a gorgeous, private dining area. Reminiscent of the outdoor dining table at Ian Fleming's Goldeneye in Jamaica, the soft glow of the lights invites diners to experience the best in cuisine while taking in the evening desert air. Made of imported Italian clay, this eco-friendly oven is not a pizza oven. Pizza ovens must be continually heated. This oven is heated only before cooking. The wood provides a moist, succulent heat to the dishes, and the ability to cook several items at once at varying degrees in the oven by moving the wood to different places inside its cook space. The debut Oven Menu included some remarkable delights. 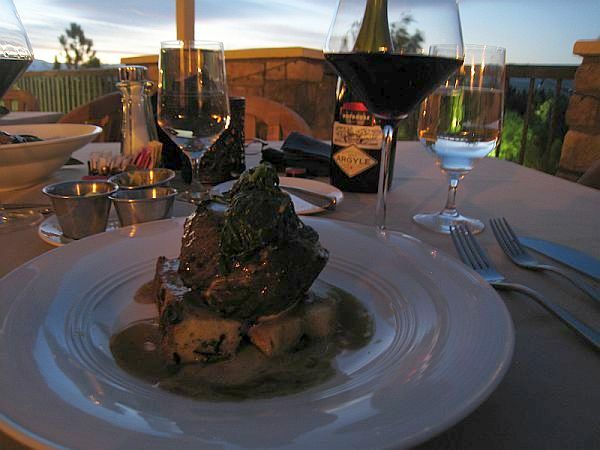 The oven braised prime beef shortribs are the best we've had in the Coachella Valley. The sides of roasted asparagus, butternut squash and baby arugula salad perfectly complement the shortribs. Finally the dessert of bread pudding with house-made coffee ice cream completes the elegant menu. 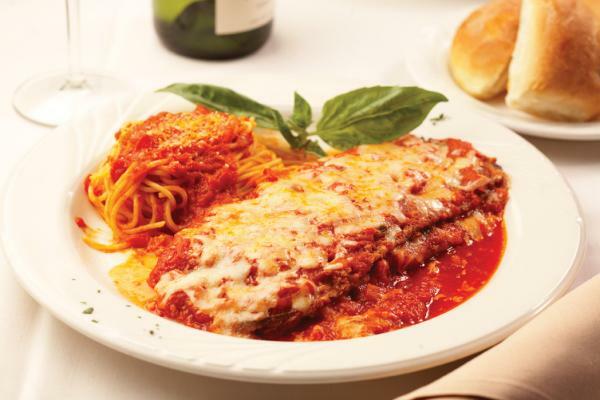 Copley's Restaurant continues to be the innovator in the Coachella Valley's top restaurants. Romantic and historical in its venue, exceptional in its cuisine, daring and eco-friendly in its creation of a new outdoor dining area featuring the Italian wood-burning oven, Copley's Restaurant is not to be missed. 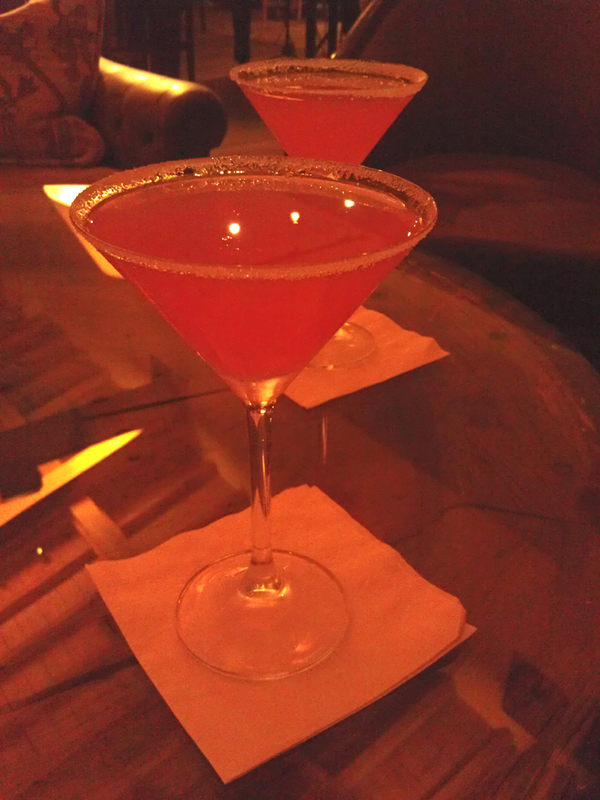 Martini over Palm Canyon Drive. Civilized. 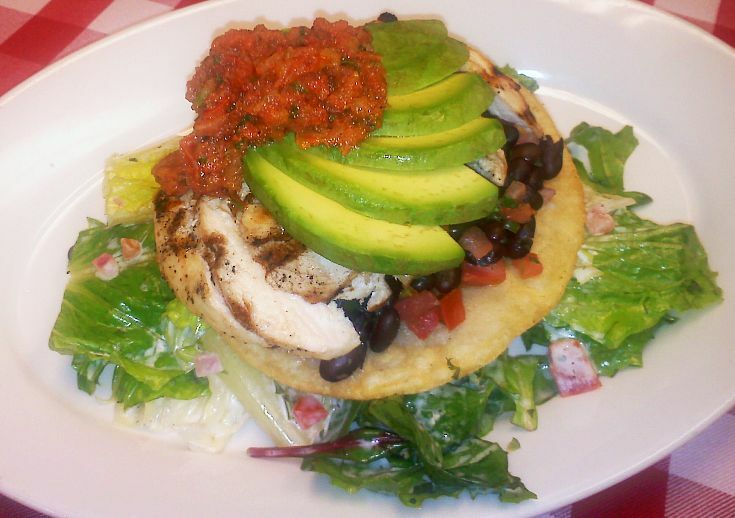 An elegant chicken taco salad. Love that avocado! 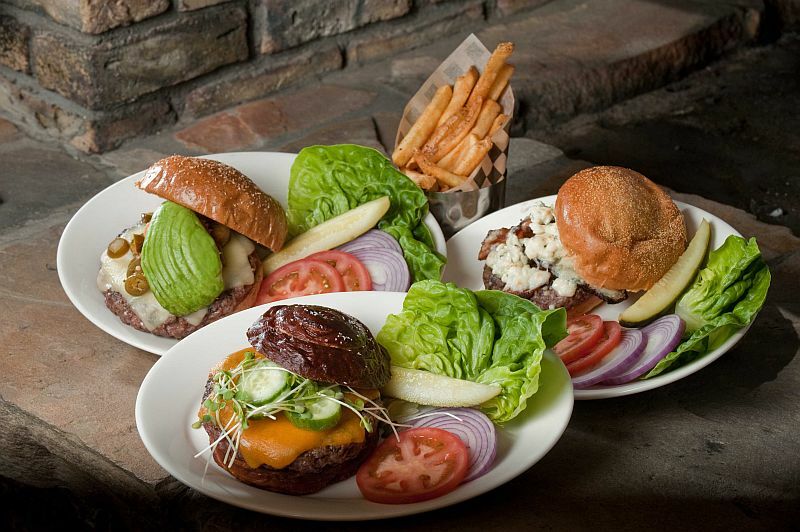 Burger Master… Grind Brgr Bar in Palm Springs has the best burgers in the Valley. There is no comparison. 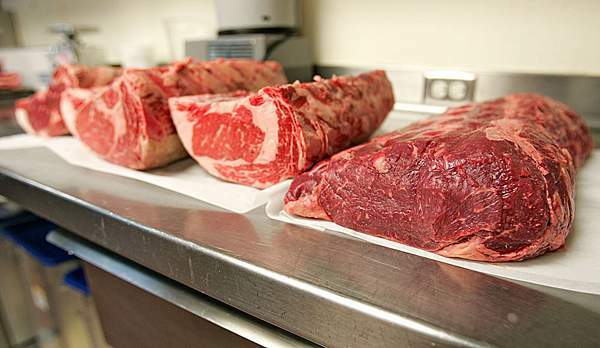 Grind starts with natural grass fed meats (beef, turkey, buffalo, lamb, and an occasional exotic like elk). Why does this matter, you ask? Well, taste of course, but there are other important reasons as well. It's almost always leaner than grain finished beef. It has no hormones or antibiotics. It has a better ratio of omega 3 to omega 6 fatty acids and it helps support local producers and manage natural resources. To complement the burgers, sides like parmesan truffle fries and sweet potato fries do the trick. Readers have asked, why is everything a la carte? The answer is this. Grind wants you to have the option of just ordering a burger. 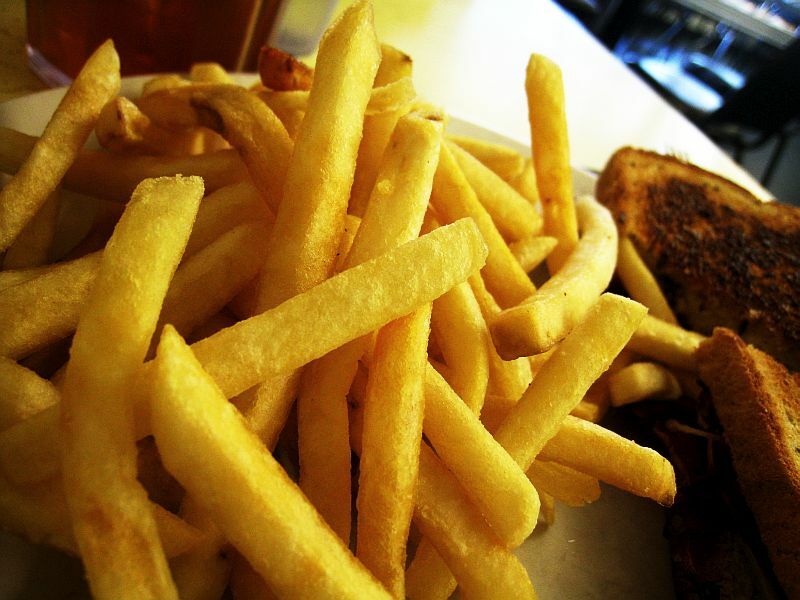 Many places heap the fries on you whether you want them or not, and you pay for them either way. This way, you can choose just the burger. We like that since we're careful about our carbs, and choose a burger bun over fries for our carbs, (although technically we could get a "naked" burger (without bun) and have the fries)… Something to think about for next time. Grind also has other delicious entrees for "burger free" people, although we technically shouldn't talk about them here. Sacreligious in this type of article, but here goes… The chicken taco salad is very good, and the drunken shrimp works it. Both are great non-burger options. 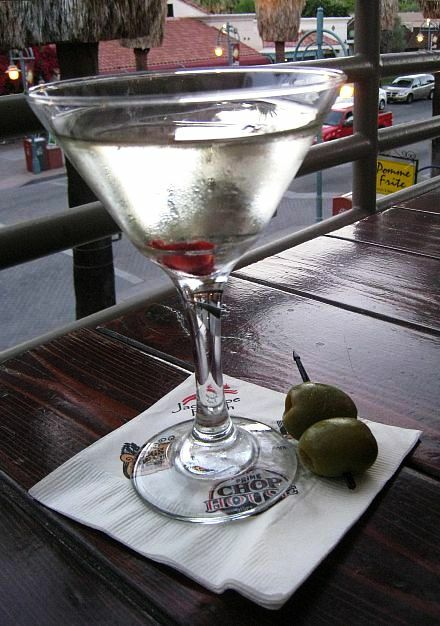 As for drinks, any martini is fantastic. The well drinks are reasonably priced, and last but not least are the Spiked Milkshakes. 21 and over only please, as these have alcohol in them and are a happy ending to an excellent meal. Combine this with an excellent balcony overlooking Palm Canyon Drive, with plenty of "people watching" as the sun sets and you've got a hands down winner. 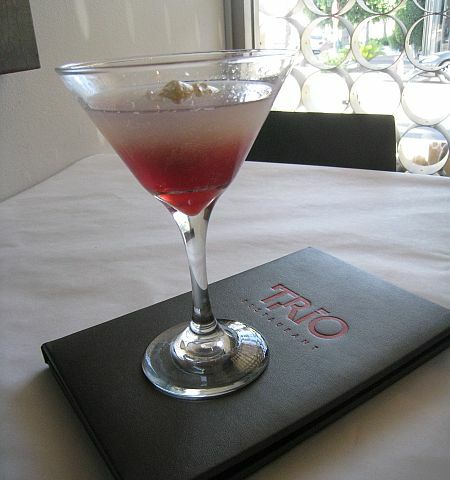 A great raspberry martini and the best lemon drop martini in the Valley! At World's End… Bellatrix is in a class by itself, literally, located in the Classic Club, North of the I-10. 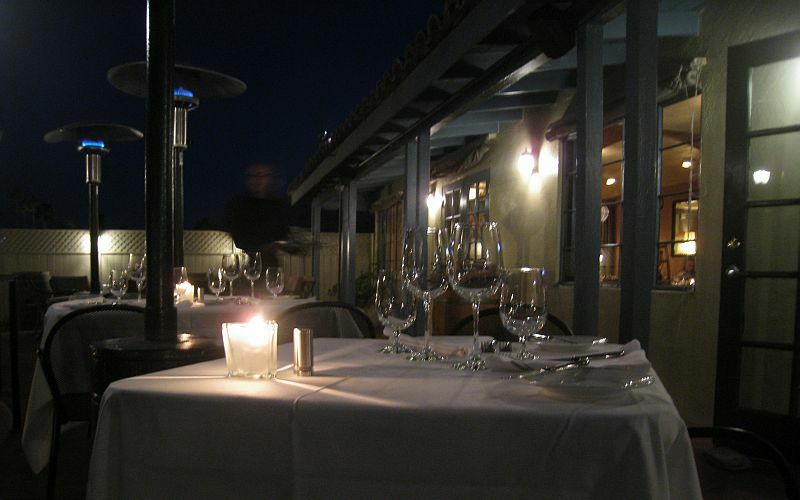 Because of its unique location, the views are extraordinary and unlike any other restaurant in the valley. Granted, the winds can be gusty, but if you go on the right evening, the combined experience of libations, contemporary American cuisine, service and views, is unparalleled. 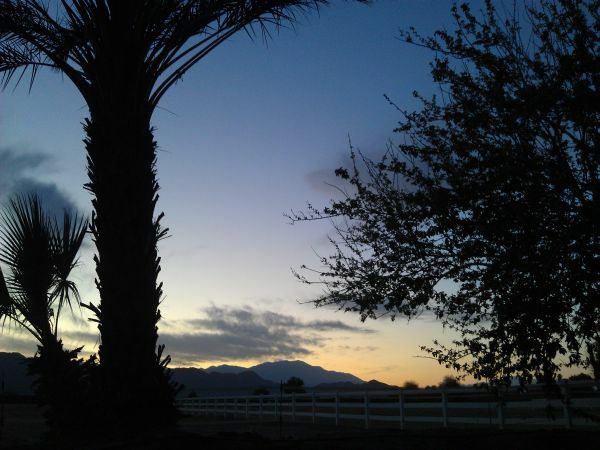 Arriving at twilight, we dined on the veranda overlooking the golf course, and in the distance, the Indio Hills backed up by the Little San Bernardino Mountains. Turn your sights from left to right and you get a view from the San Gorgonio Pass all the way to the beginning of the Chocolate Mountains to the South. Best of all, there is a distinct border where civilization ends and the desert wilderness begins, and that's what makes its location so unique. 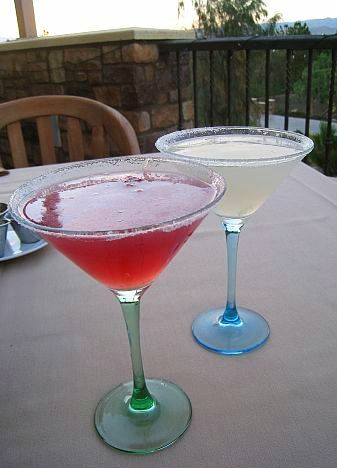 Add a raspberry martini and to date, the best lemon drop martini we've had in the valley, as we watched the sun set in the pass, and it starts the beginning of a romantic, desert evening. 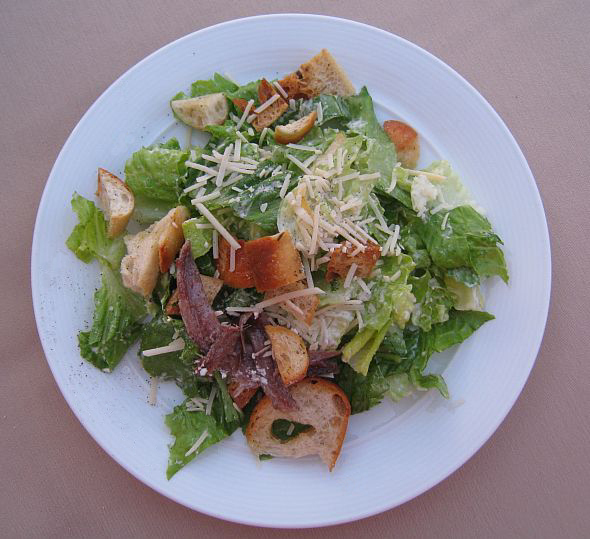 Beginning with warm rolls and butter, we enjoyed the Caesar salad and Bellatrix salad made of baby greens, tomatoes, red onion, ciabatta croutons, in a delicious, marinated feta and sherry Dijon vinaigrette. Just before dessert, a meteor sped across the dark, night sky, capping the evening, until of course, the caramel cheesecake took the stage. Sinful. Absolutely sinful. No other word. So combine the cuisine, the service, the atmosphere and the view, and you've got Bellatrix, a unique, desert dining experience which is not to be missed. 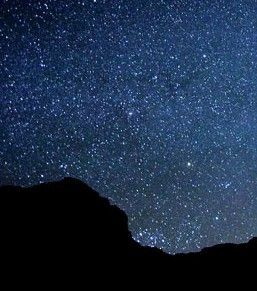 We highly suggest coming to Bellatrix during the three big meteor showers of the year, since the view is so dark and clear at night… The Leonids, associated with comet Tempel-Tuttle peak around November 17. The Geminids, caused by a probable Palladian asteroid, peak around December 14, and the Perseids, associated with the comet Swift-Tuttle, which peak in mid-August. 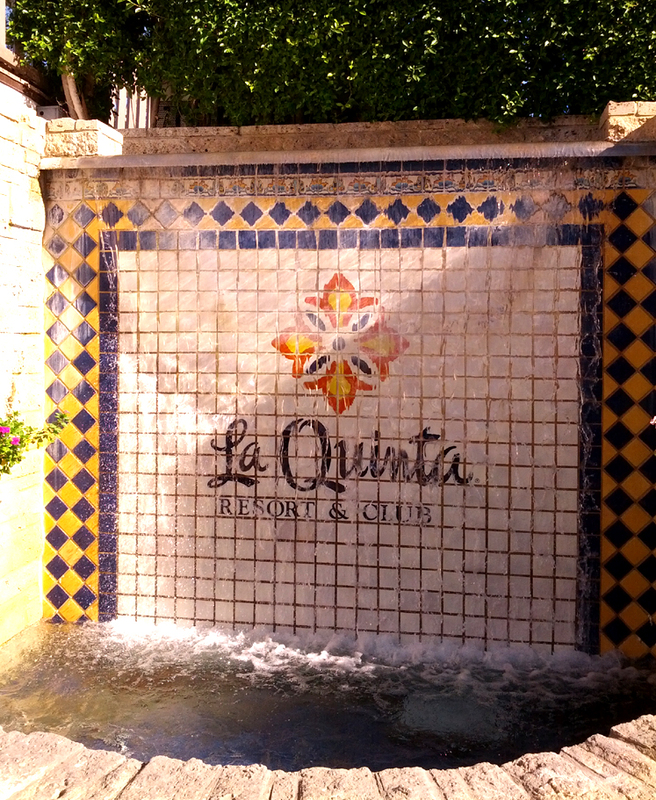 A stunning main dining room reflects La Quinta Resort's history. 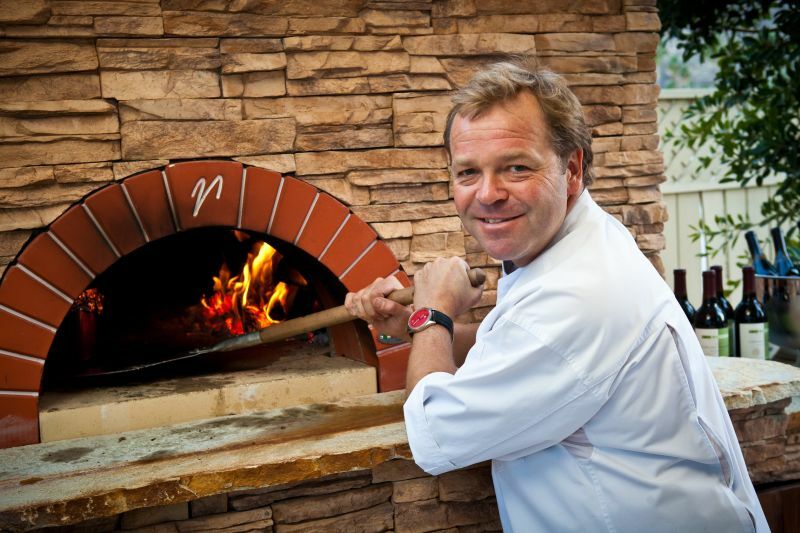 Nestled away in the gorgeous La Quinta Resort and Spa, award-winning Morgan's in the Desert is the Coachella Valley's gourmet "piece de resistance" headed by uber-chef Jimmy Schmidt. Assisted by Brian Recor, Chef de Cuisine of Morgan's, Schmidt's created an ever-changing "farm-to-table" menu featuring succulent roast meat and seafood fare. Highlights includeSeared Main Diver Scallops,Fennel & Roast Garlic Crusted Rack of Colorado Lamb,Coriander CrustedAlaskan Halibut, and finest super Prime Angus Beef prepared to order. And let's not forget their wide range of hand-crafted cocktails and starters. Their Tangerine-Ginger Margarita is not to be missed! 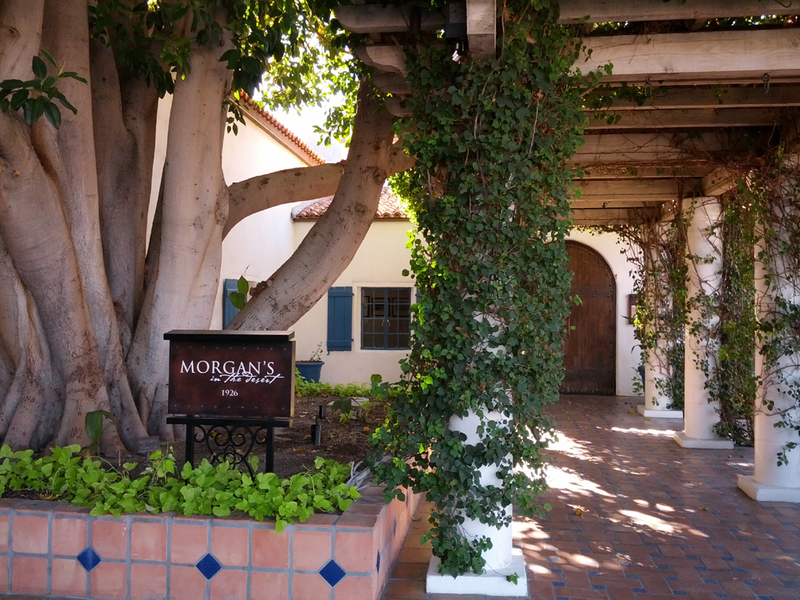 Softly lit, with seamlessly blended indoor and outdoor dining areas, Morgan's is more than a restaurant -- it's a destination. You go for the entire experience. The rustic, softly lit mission-style 1930's architecture relaxes guests with beamed ceilings, soft furniture, and walls adorned with tapestries and mosaics, as the big tiled fireplace crackles with friendly flames. 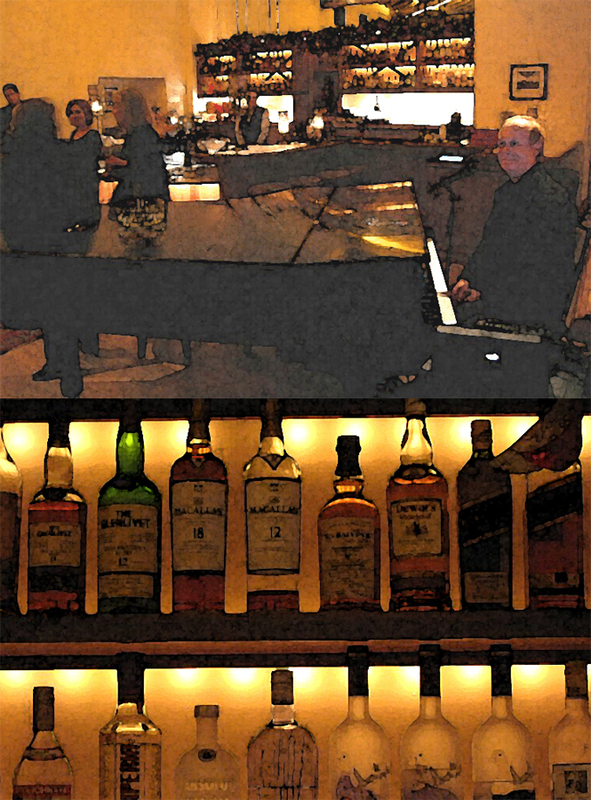 As live music wafts over from the bar and its choice of handcrafted cocktails using the ultimate in fresh ingredients, you realize you're in the midst of a stylish and luxurious nightime oasis! 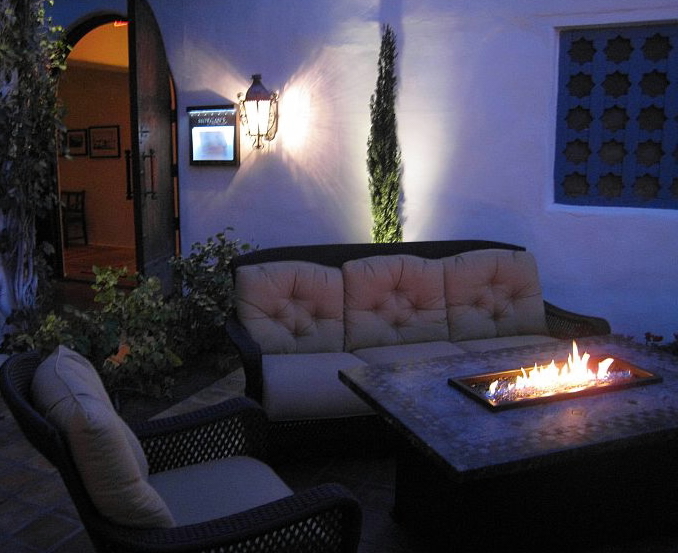 Outdoor lounge areas offer glass rock-filled fire pits for enjoying cool desert nights. 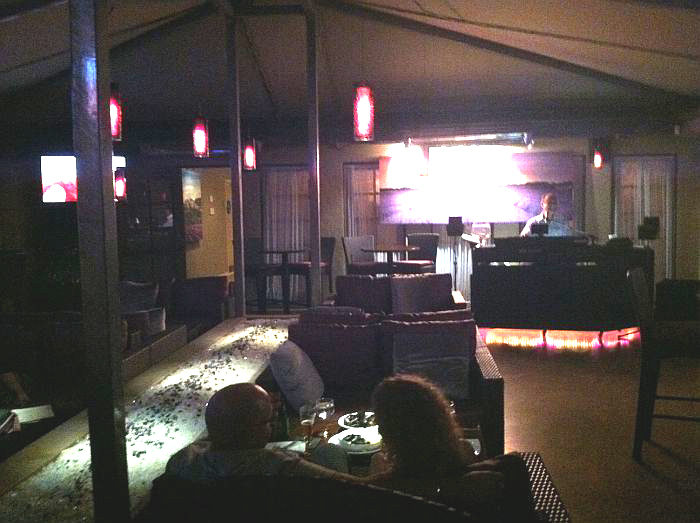 So after dinner, sidle up to the bar for a nightcap and some live piano music, or snuggle up on the patio in front of the firepits. 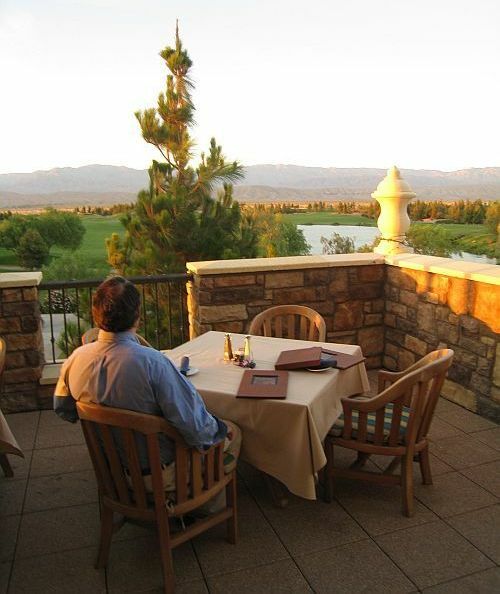 Morgan's in the Desert takes full advantage of its classic, desert surroundings to create a stylish, top quality escape from the bustle of the everyday world -- destined to become one of the best restaurants in the Coachella Valley. 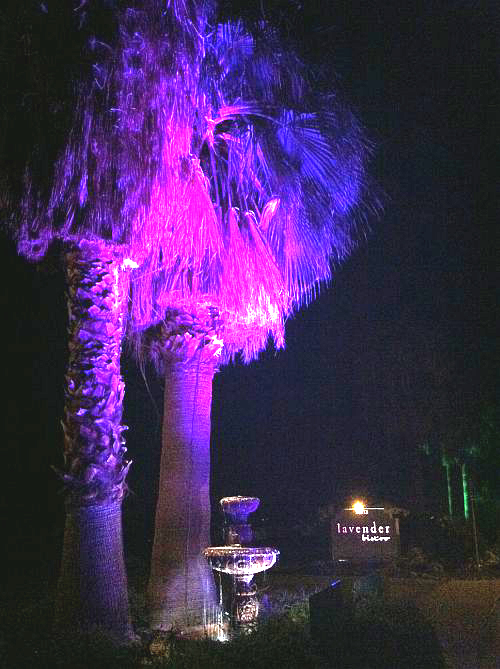 Nestled near Old Town La Quinta among the lavender lighted palms, sits the gorgeous Lavender Bistro. 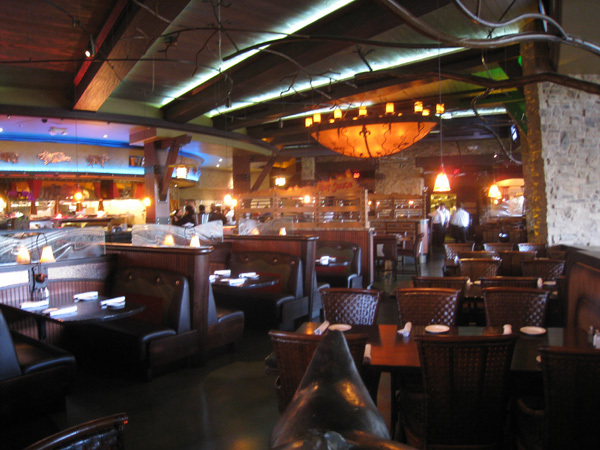 This is the finest free standing restaurant in the East Valley. Its decor, romantic and exquisite for the senses, lavender, purple, and violet hues in soft and twinkling light. 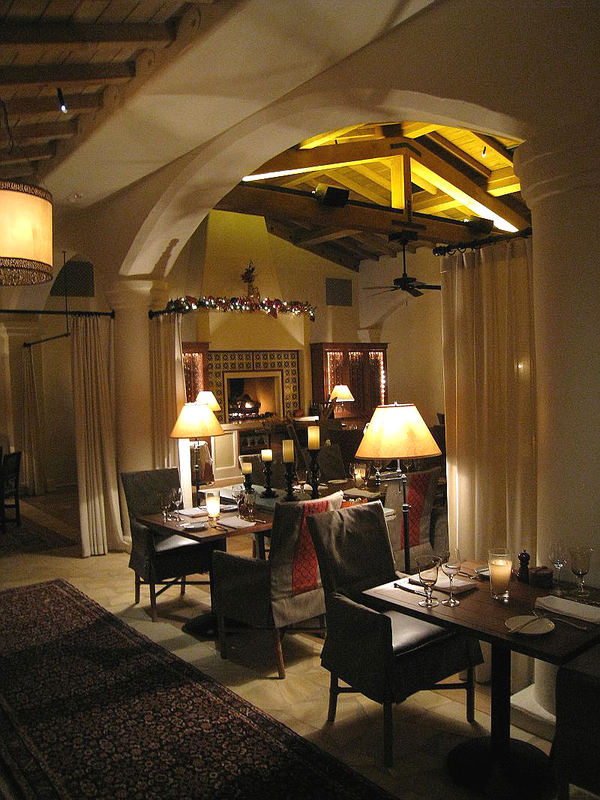 There are two dining rooms, a bar, a covered area of hte patio and the exquisite patio. The staff and service are soundless and efficient. 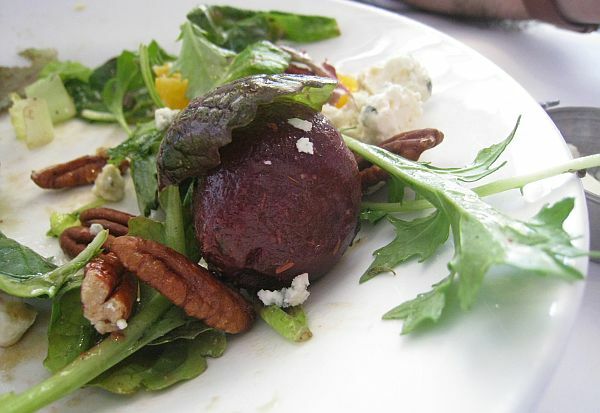 There is a rhythm to Lavender Bistro that is reminiscent of the south of France. Carefree, but precise. The energy is relaxed, pretty. You cannot go wrong with any of Lavender Bistro's Cold Seafood offerings. The King Crab Cocktail is particularly fine. 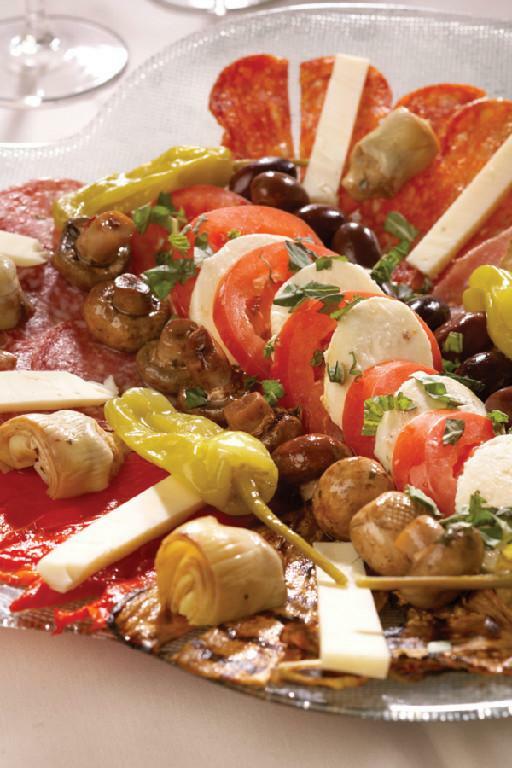 Appetizers are wonderfully varied. Standouts include Vine Ripened Tomato Salad and the Wild Mushroom Soup. Exceptional entrees include Medallions of Chilean Sea Bass simmered in a cocnut curry, basmati rice, with cucumber riata, tomato salsa, pineapple chutney and papadam flatbread. The Grilled Black Angus Filet Mignon, sauteed green beans, shallots jam, Lombardy gorgonzola pudding, and simple syrah jus is near perfect. 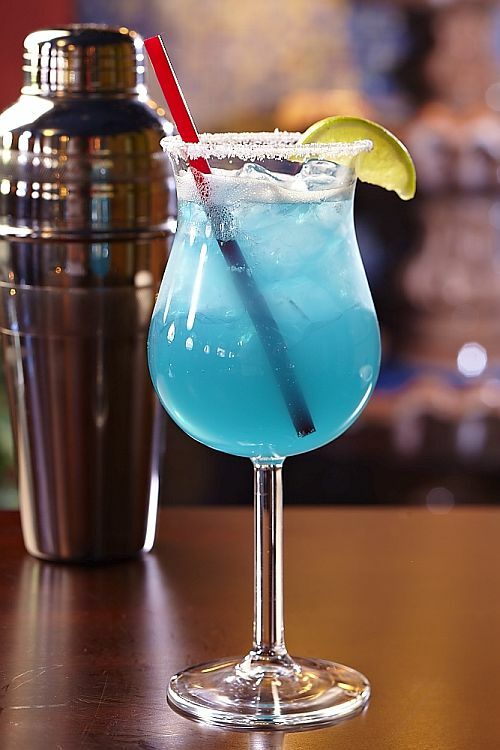 Happy Hour is everyday starting at 4 PM and going all night. 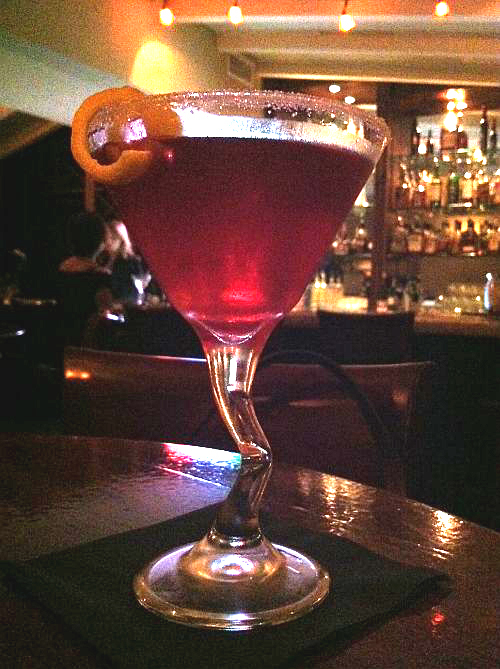 Be sure to try the Lavender Martini. There is beautiful romance to this restaurant. 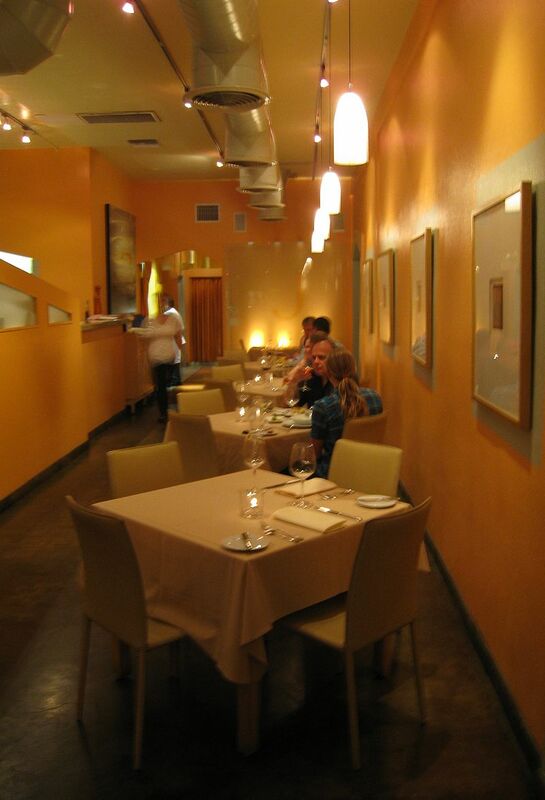 The owner, the chef and the staff clearly love what they do, and it comes with natural finesse. 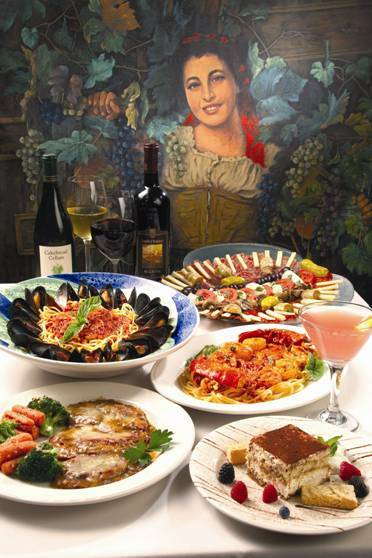 Lavender Bistro is a do-not-miss culinary experience in the Coachella Valley. 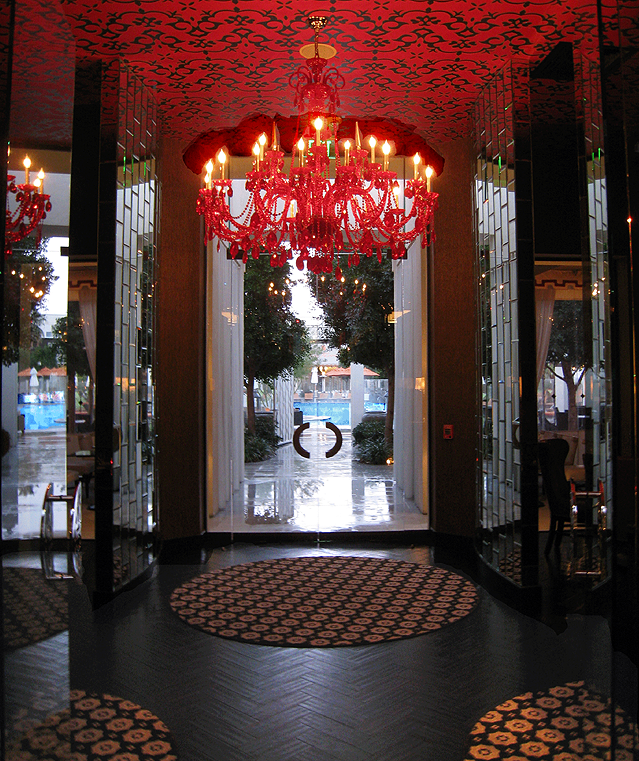 The Riviera's stunning decor sets the stage for a great evening out. Talk about a spectacular entrance! Banquettes line either side of the foyer, offering diners panoramic views of the dramatic, fire-pit lit nighttime pool area. Circa 59's dramatic dining room decor. 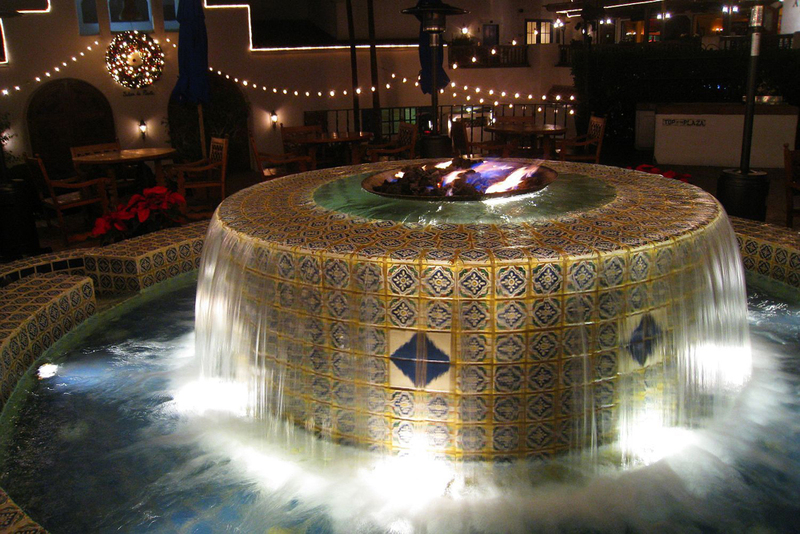 ...and poolside firepits provide plenty of opportunities for pre- and post- dinner socializing! 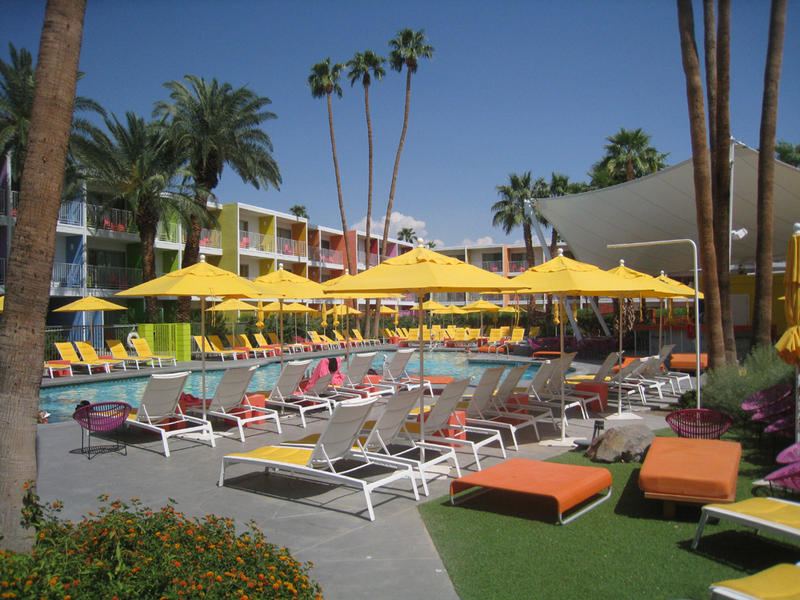 Eclectic elegance in Palm Springs··· The Riviera Resort and Spa embraces its star studded history, harkening back to the days of the Rat Pack but exuding a sharp, modern fashion sense that envelops the first time visitor. 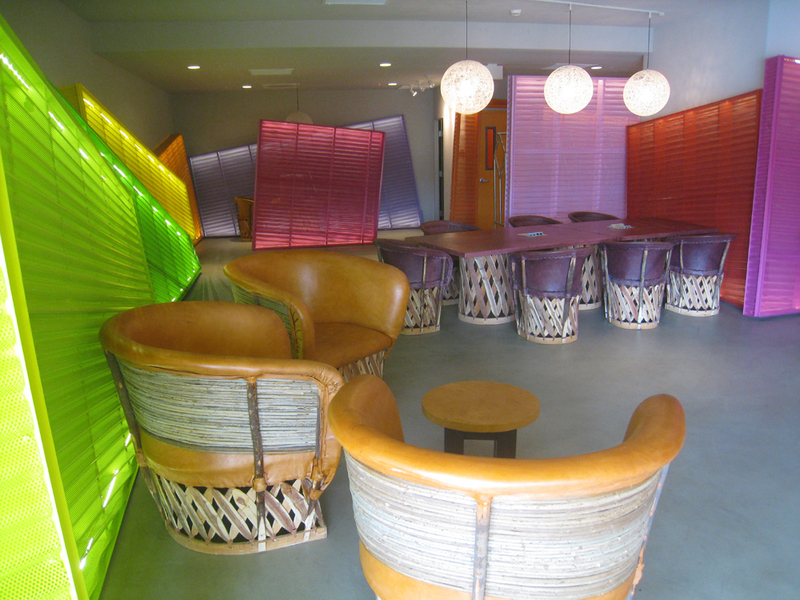 The textures and design materials used in the hotel's total makeover are rich and tactile. Vinyls, velvets, leathers, fluorescents, shag, tiny mirrors beaming sequins of light, amid bold primary colors, black crystal chandeliers, and lipstick red wallpaper. This is the epitome of post- modern eclecticism. Daring to say the least, and it works. Big time. 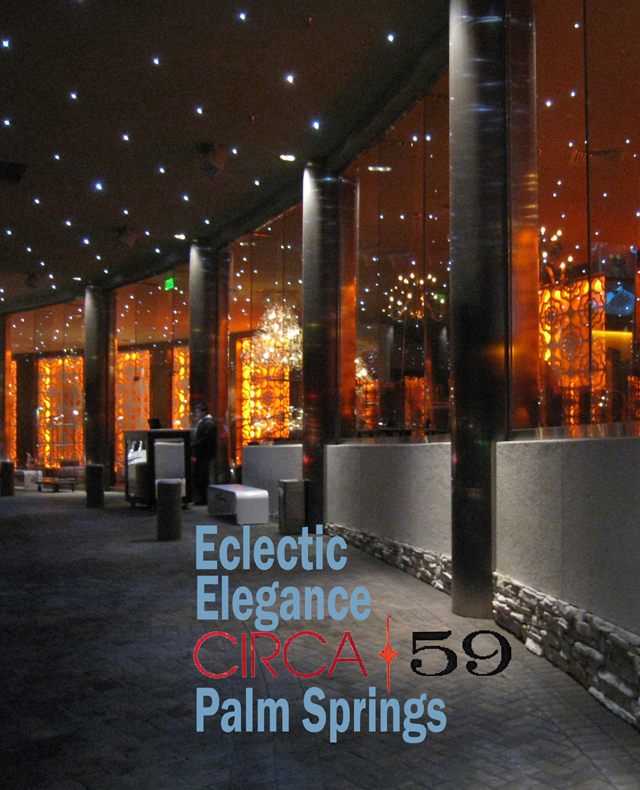 Circa 59 is the hotel's signature restaurant, offering a great meal and a fun night out in spectacular surroundings. 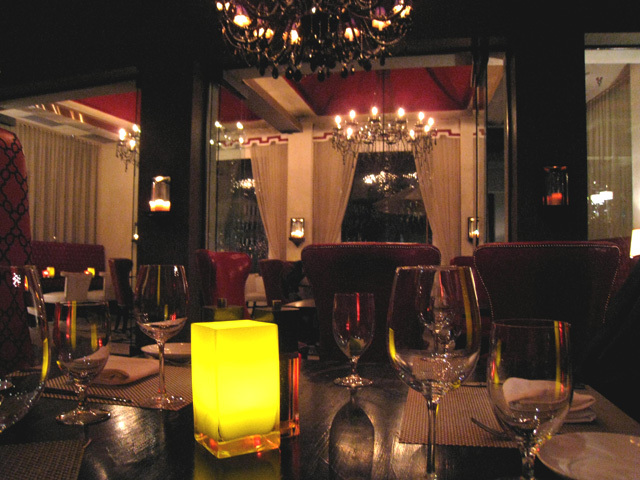 Check out their on-going series of West Coast wine dinners! Flanking either side of the hotel's gigantic entrance hallway, and anchored by Sidebar, the hotel's intimate bar, Circa 59's clam-shell style banquettes and table area all offer front-and-center views of the Riviera resort's landmark main pool, one of three pools at the resort. Talk about a spectacular entrance! Banquettes line either side of the foyer, offering diners panoramic views of the dramatic, fire-pit lit nighttime pool area. And what a pool! With a shape somewhere between a modern flower or a "Splat!" symbol, and surrounded by fire pits and luxurious chaise lounges, this dramatic poolside landscape used to be the aftershow hangout for the big names at the Chi Chi Club, everyone from Frank Sinatra, Dean Martin, Ella Fitzgerald, Cab Calloway, to Bing Crosby, Marilyn Monroe, and Milton Berle. Back in the day, the Hollywood "in crowd" came here to relax, party, and mingle among the beautiful people in equally magnificent surroundings. A new poolside Chiki Bar, a Polynesian tiki-chic hideaway brings that history back to life. 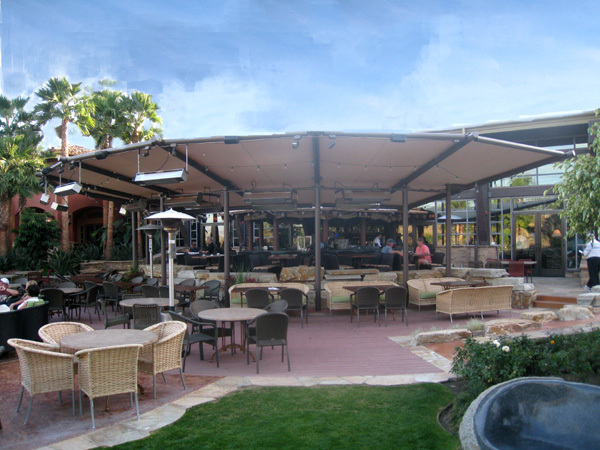 The extravagant lobby bar and poolside firepits provide plenty of opportunities for pre- and post- dinner socializing! Or check in with Circa 59 adjacent Sidebar's mixologists and check out one of their inventive concoctions - like a watermelon mojito, a real winner. And the fun doesn't end with great food and drink at Circa 59. The Riviera has fabulous poolside rooms and a spa to enjoy. 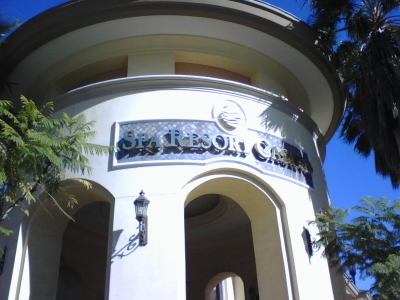 Definitely a memorable experience, the next time you're in the Desert, whether it's on a weekend visit from LA, Orange County or San Diego, or a big time golf junket from the MidWest or East Coast! Get a Room! 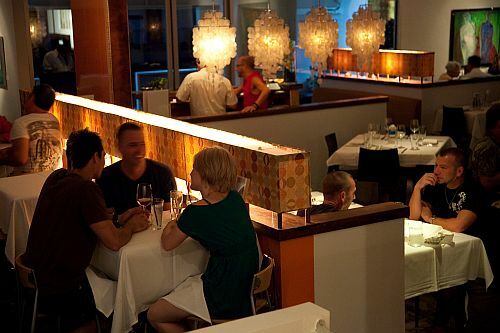 Turn a great meal at Circa 59 into a great weekend! Riviera Facts...The Riviera Resort & Spa is owned and operated by Noble House Hotels & Resorts, www.noblehousehotels.com a Seattle-based, family-run collection of distinctive luxury hotels and resorts located in Florida, New Mexico, Texas, Washington, Southern California and Newport R.I.
Talk about a colorful lobby! Vibrant, modernist pool area sets the stage for fun! 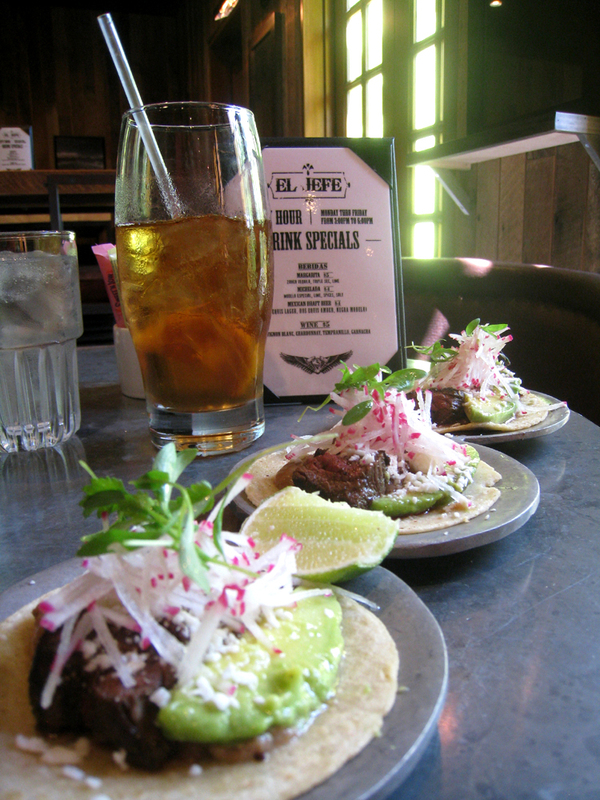 El Jefe's tacos, simply the best! 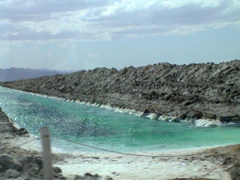 Traditional desert landscape and water features abound. 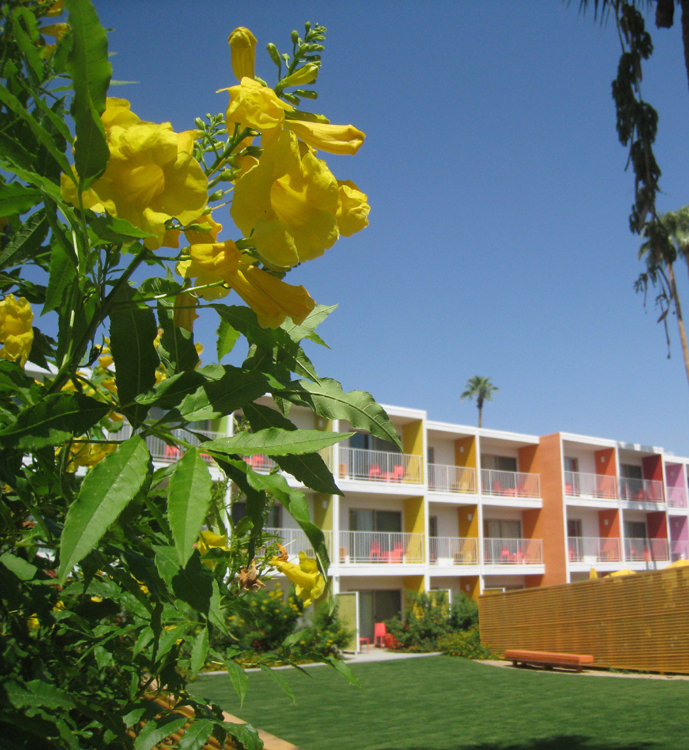 Palm Springs Spa Week is in full force from October 14-20, 2013. That's where 50 bucks gets you select signature spa treatments at some excellent venues. 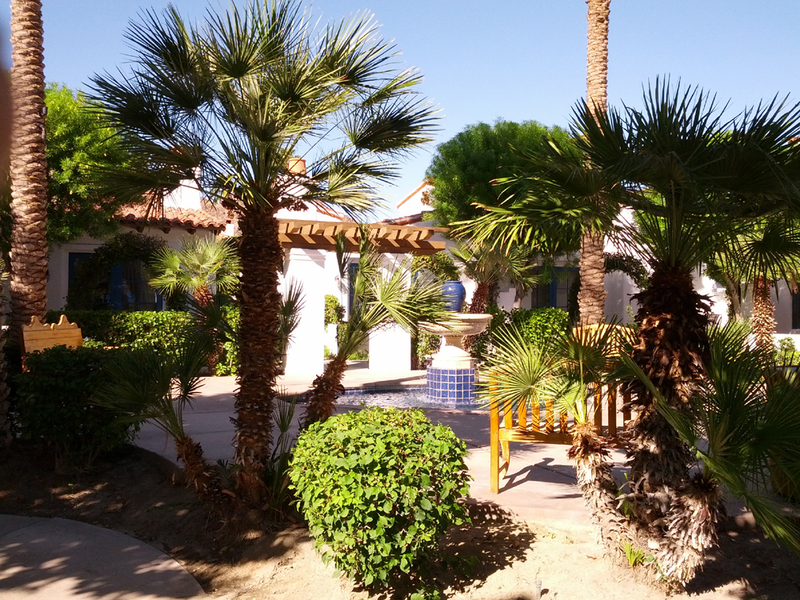 Come and take advantage of the antural beauty, dryness and brilliant sun of the desert to make you look and feel your best! 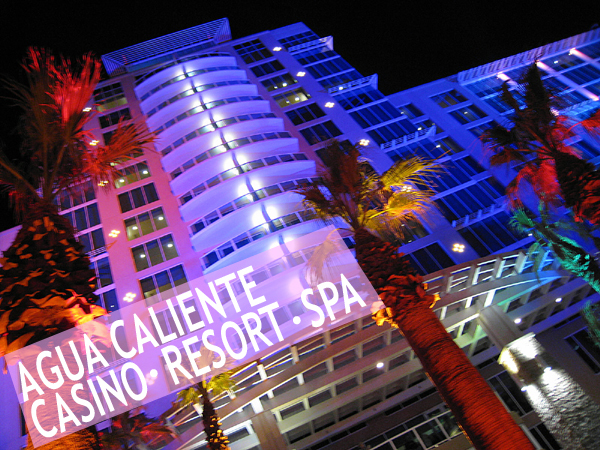 In addition to the Spas, Palm Springs and the whole Coachella Valley has incredible restaurants, hotels and attractions. Some unique nearby places you may want to research are Salvation Mountain, The Integratron, Joshua Tree National Park and the Salton Sea. They offer a unique glimpse into the desert lifestyle, whch is unlike anything else on the planet. You've come to an authentic, unique destination. Take advenatge of the splendor, the weather, the palms, the oasis. Discover the history. Marvel in the present, and think about your future. Going on now through March 16. Come see some of the finest showjumping in the world. 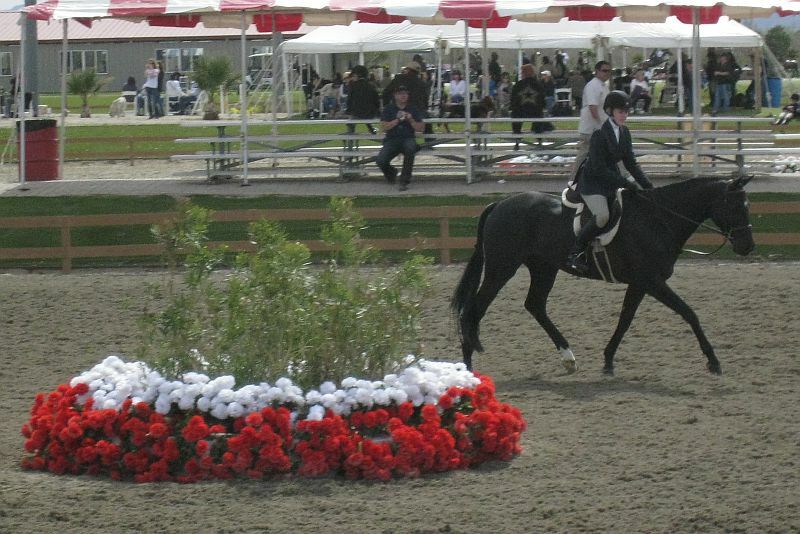 Over a thousand horses and riders competing in 7 weeks of hunting, jumping and equitation all out at the HITS Thermal Horse Show Park. Bring your sun hat, enjoy some food, and sit back to watch an incredible sport! Headlining Coachella Music and Arts Festival this year are Outkast, Muse and Arcade Fire. Nestled in the Empire Polo Club grounds, Coachella provides a great venue to hear many great bands from all over the musical spectrum. Relax with the celebrities, enjoy the ferris wheel, mingle among the art exhibits. It's all here for the taking. Looking out over the barren mesas as far as the eye can see in the town of Landers sits an amazing structure called the Integratron. Acoustically perfect, this dome is the life's project of George Van Tassel, a former Hughes Aircraft engineer. 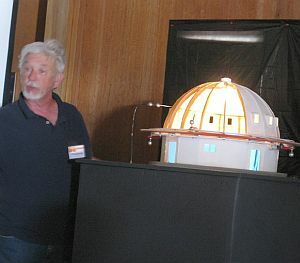 He claims aliens told him how to build this Integratron, which is supposed to be a machine that rejuvenates cells. A Fountain of Youth if you will. Whether or not the Integratron is a Fountain of Youth is a debate as it was never completed. But there's no denying the magnetic energy in the atmosphere around it. It is built on a magnetic vortex. If you haven't done it, you must experience the sound bath, a unique experience that calms the mind and body. To be inside the soundless dome is an expression all its own. Viewing the Leonid Meteor Shower at a destination like the Integratron is a rite of passage. The skies are dark, expansive and welcoming. It will be cool out so you need to bring layers and perhaps a warm drink in a thermos. The darker and later it gets, the more you see. Be prepared to take in the magic of the desert skies!